Back in 1978, I rode in the Bouquet Canyon Road Race, which was a bicycle race that went up Francisquito Canyon, across through Green Valley, and back down Bouquet Canyon. 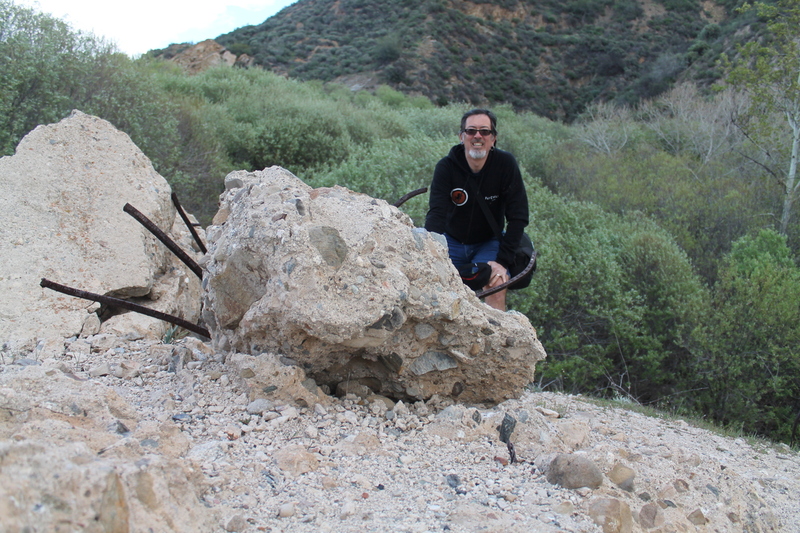 And at the time, I remember us riding up the canyon, and then, where the road went through a narrow spot, I saw great chunks of concrete next to the road. It was obviously the rubble from some great structure that had met an untimely end. 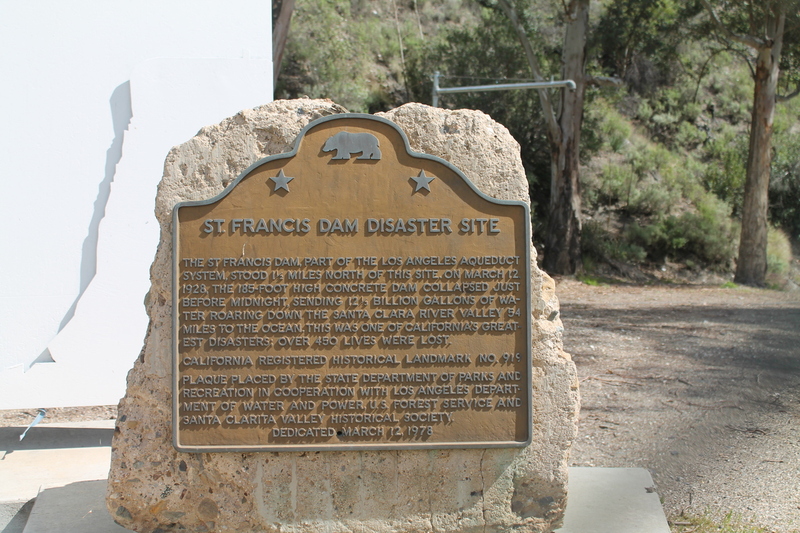 So, years later, I looked it up and read about the St Francis dam and its collapse in 1928. And today, the Obscura Society was doing a tour of the site. 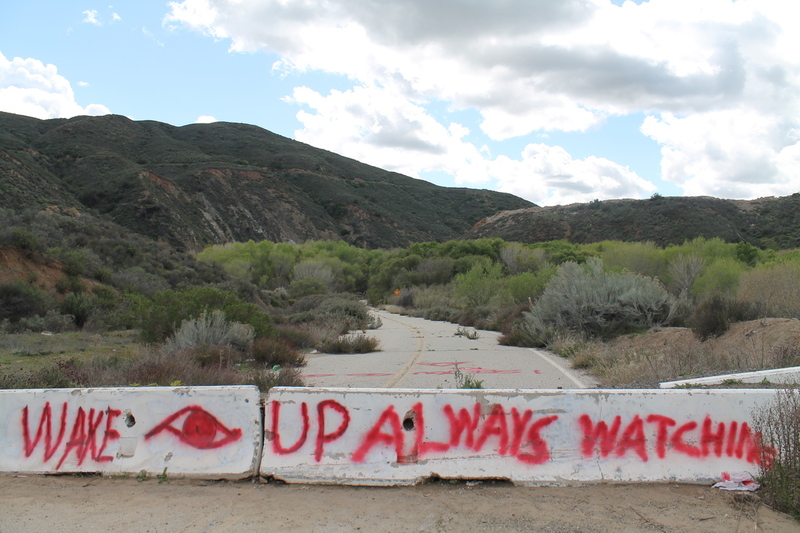 We met up at the fire station that is below the dam site, and next to DWP Power Plant #2. 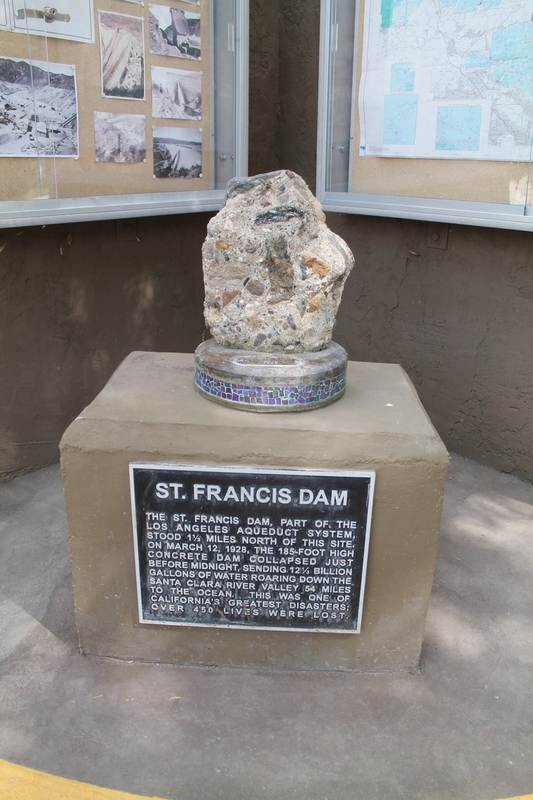 They had a small exhibit with photos of the dam both before and after the collapse. Our guide for the tour was Ann Stansell, who has studied the disaster, and who wrote her thesis about it. 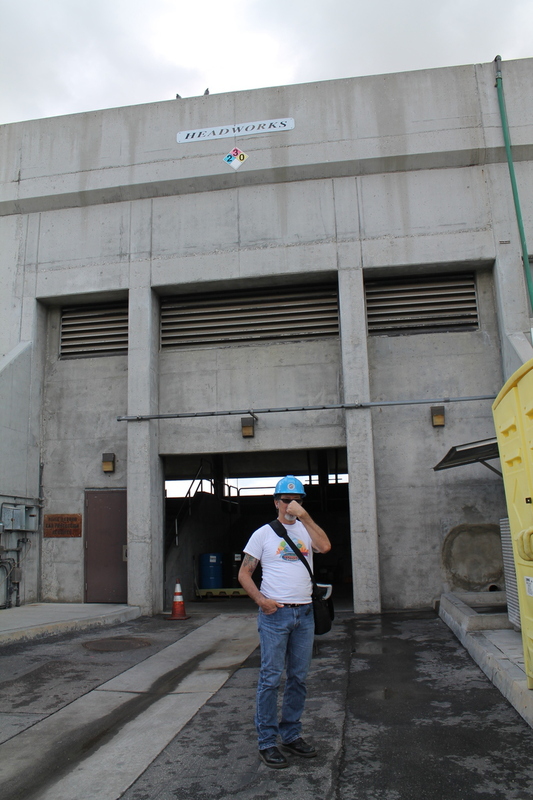 After looking at the photos and at the power plant, we all headed up the road to just above the dam site. The old road through the canyon that I remembered riding on had been washed away in about 2005, and a new road was built around the washed-out section. So we met up at the top of the abandoned section of the road, and then we walked back down the canyon to the actual dam site. 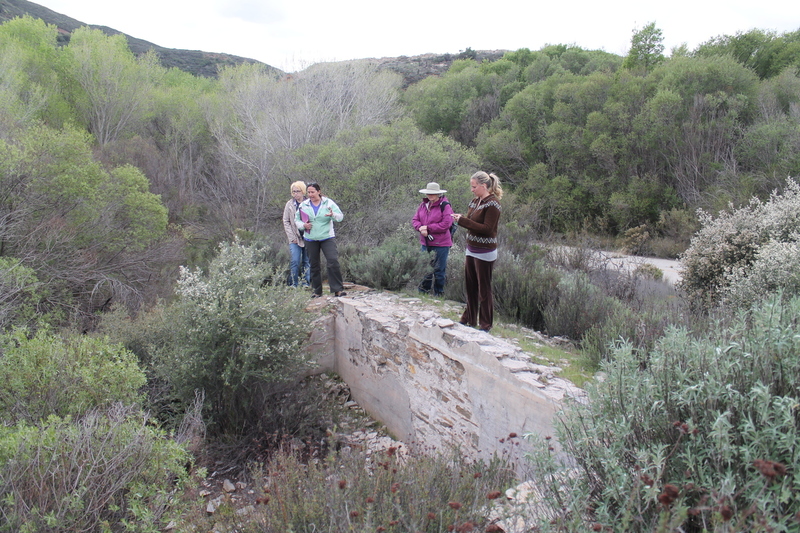 Along the way, we saw the foundations of a small hotel that had stood in the canyon before being flooded out when they started filling the reservoir. 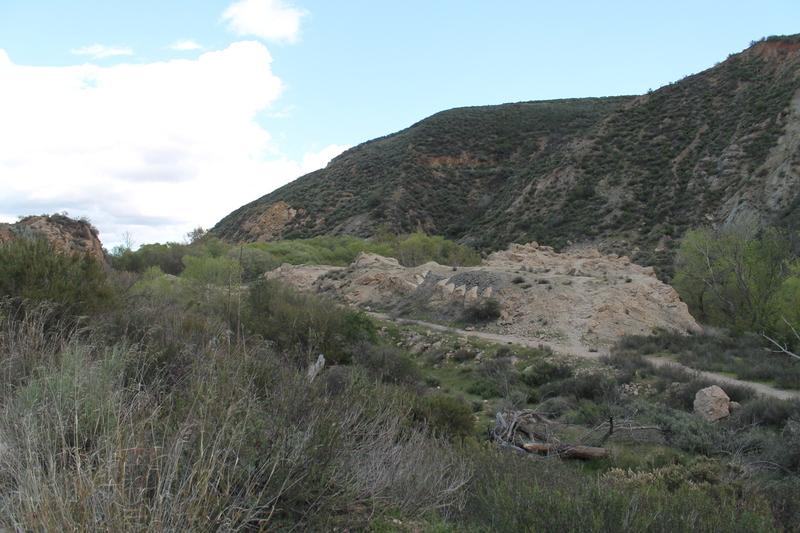 The group was going to climb up to the remains of the wing dike on the hillside above the west wall of the canyon, but before doing that, I followed Sandi down into the rubble field to see the big chunks of concrete. After looking at the rubble close-up, I headed up the hillside to catch up with the group. They’d said that it was steep, and kind of a hard climb. But I figured it couldn’t be much worse than climbing skyscraper stairs, and I was able to catch up with them. 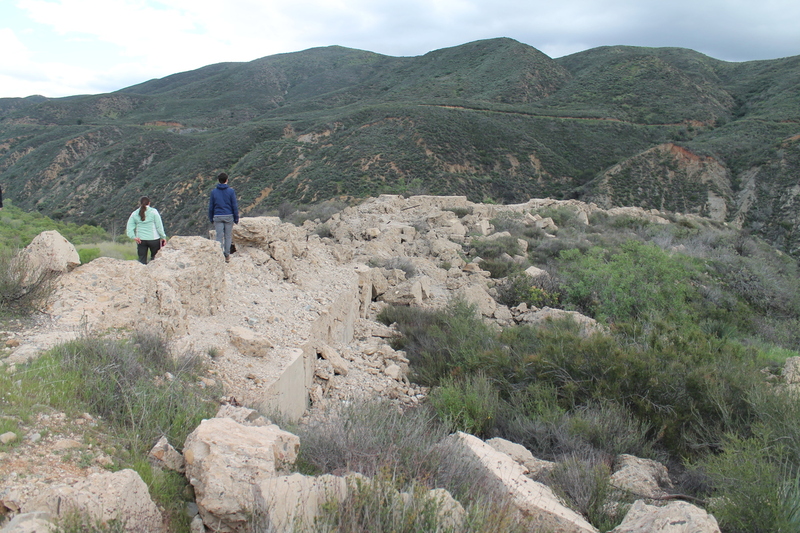 And at the top, we got to see the remains of the wing dike. We walked out to the end of it, and from there, we could look across the canyon and visualize what the dam looked like when it was still standing. 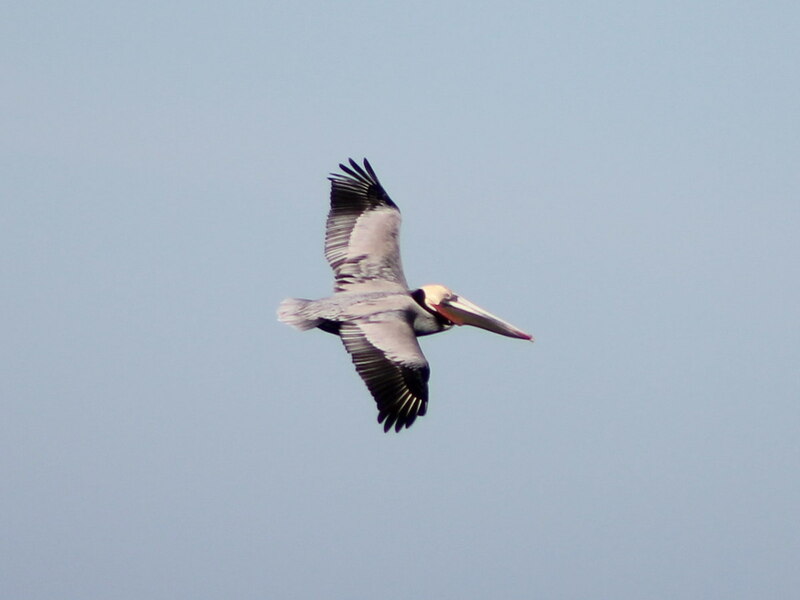 It was really pretty large. 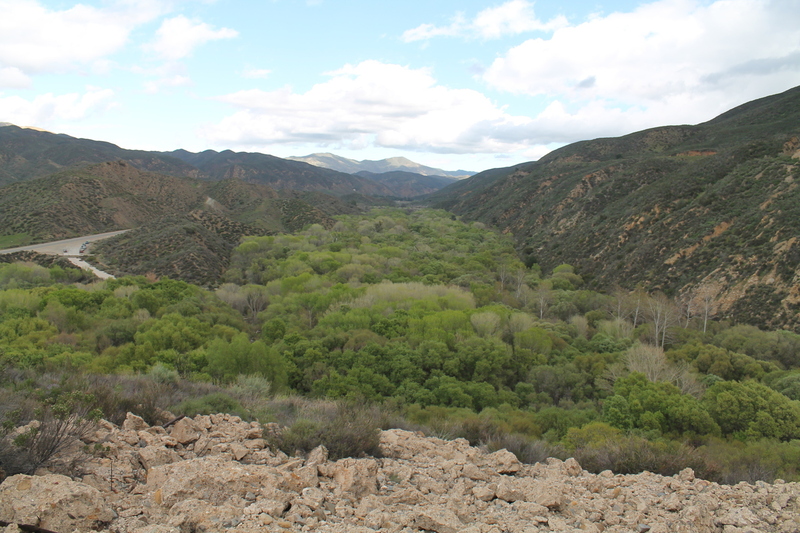 Ann also pointed out that the trees growing in the part of the canyon that used to be the reservoir are much greener and thicker than the ones below the dam site. She said that during the few years that there was a reservoir there silt collected on the bottom, and apparently the trees like that. 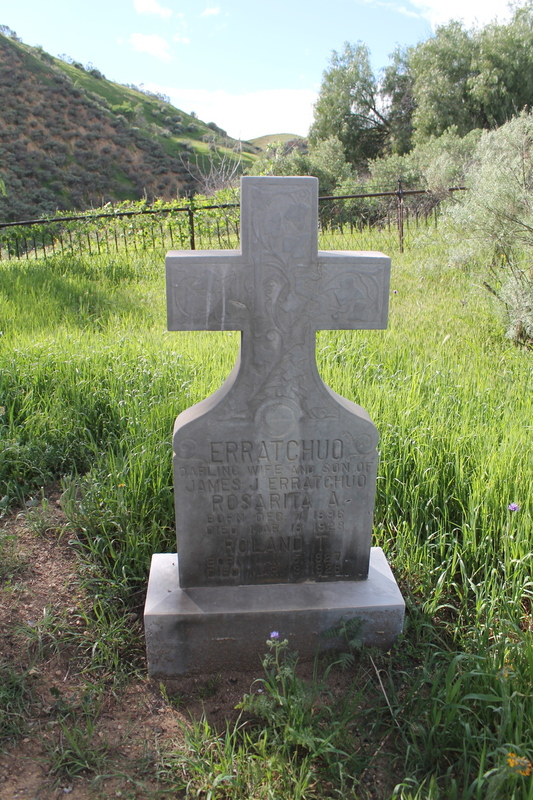 Leaving the dam site, we headed downstream a few miles to see the Ruiz family cemetery. 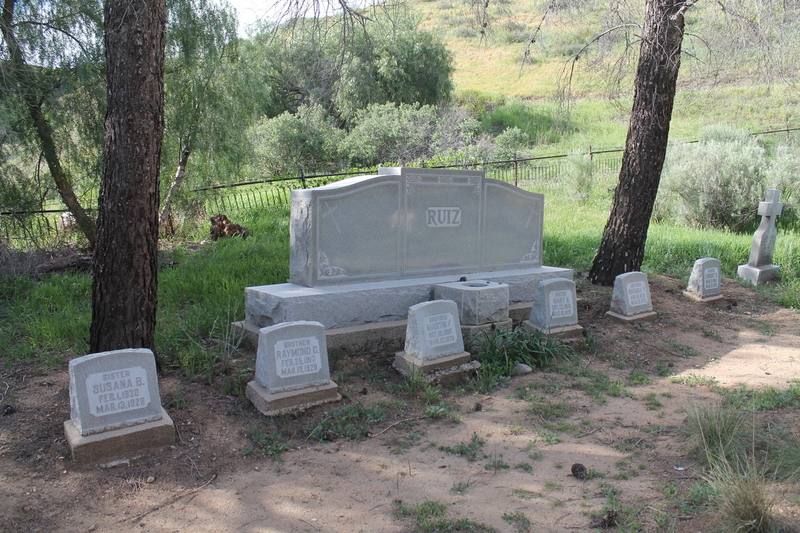 A large number of the Ruiz family members were killed in the flood, and they were all buried there. The cemetery itself is on a small hill, so it was just above the level of the flood waters. 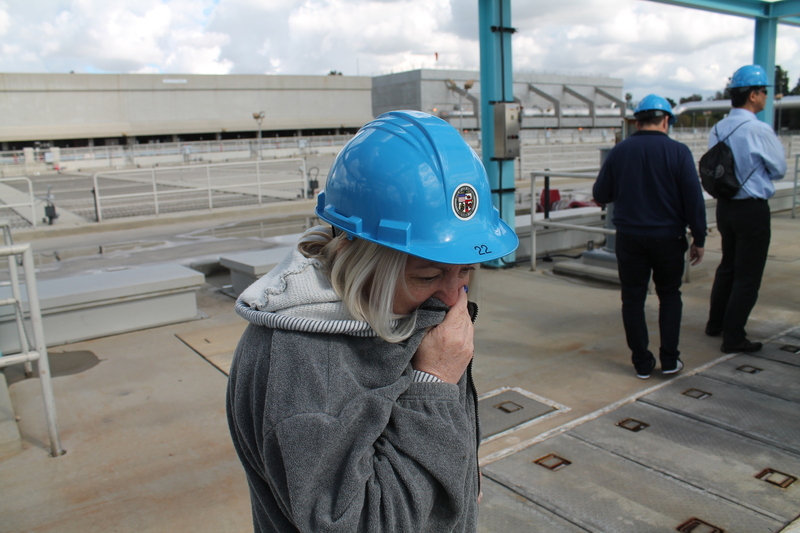 Last March, we had a chance to take a tour of the Hyperion sewage treatment plant. 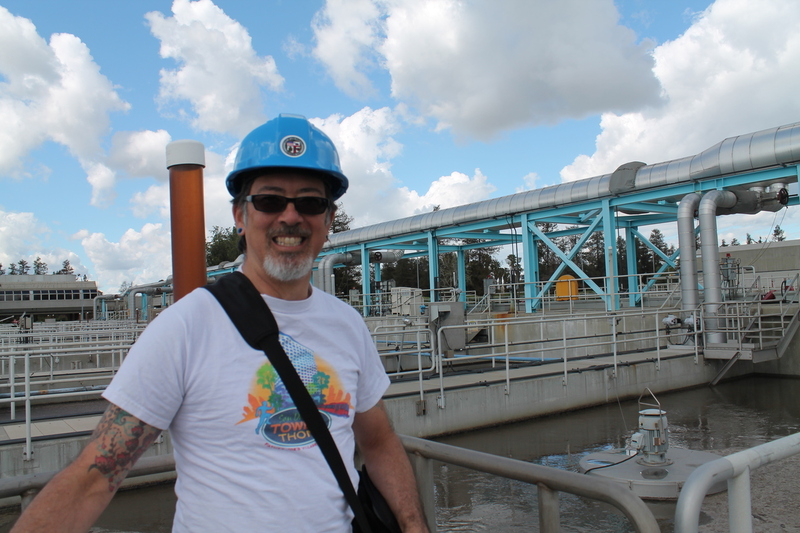 When we were there, they mentioned that there is another plant in Van Nuys that treats some tens of millions of gallons of wastewater every day, and it’s the reason why the Los Angeles River has water in it year-round now. 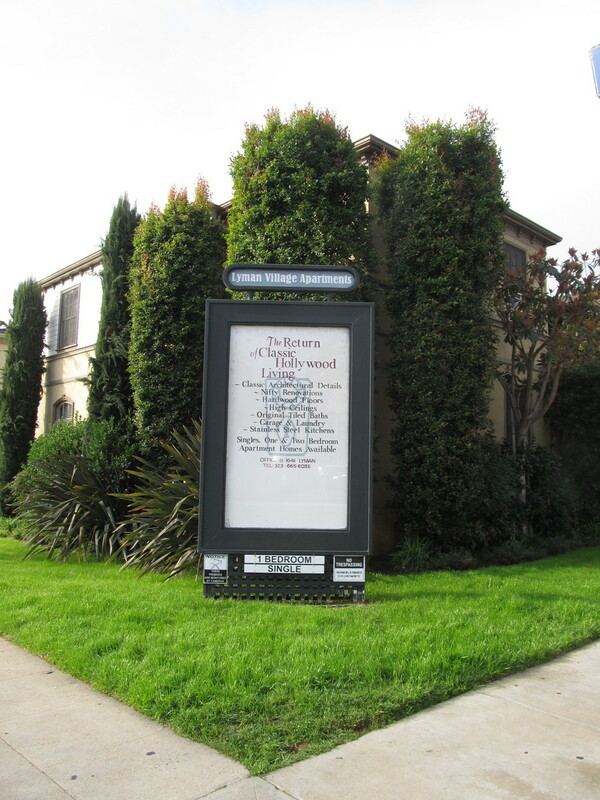 And this week, the Obscura Society people set up a tour of it. 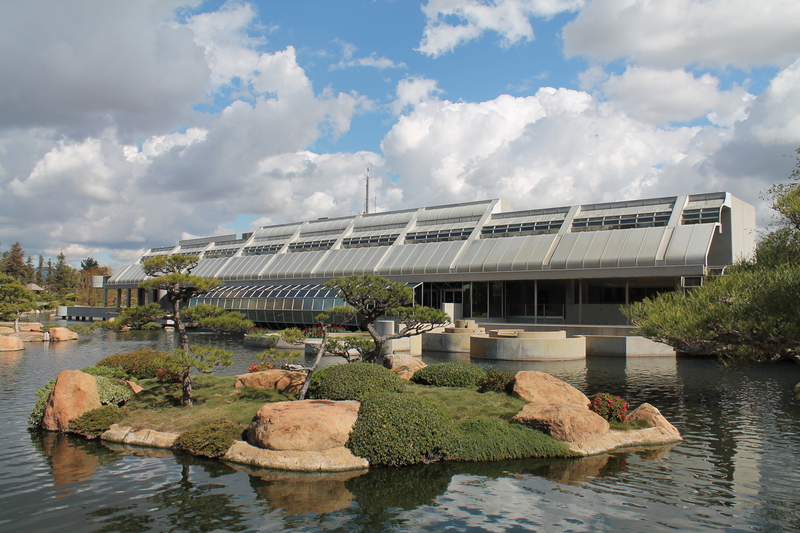 The Tillman plant is quite a bit smaller than Hyperion, but it has the distinction of having a nice artificial lake and a Japanese garden outside, and the main building was used as the exterior shot of Starfleet Academy in several episodes of “Star Trek: The Next Generation”. When we got there, they put us in hard hats for the tour of the plant. 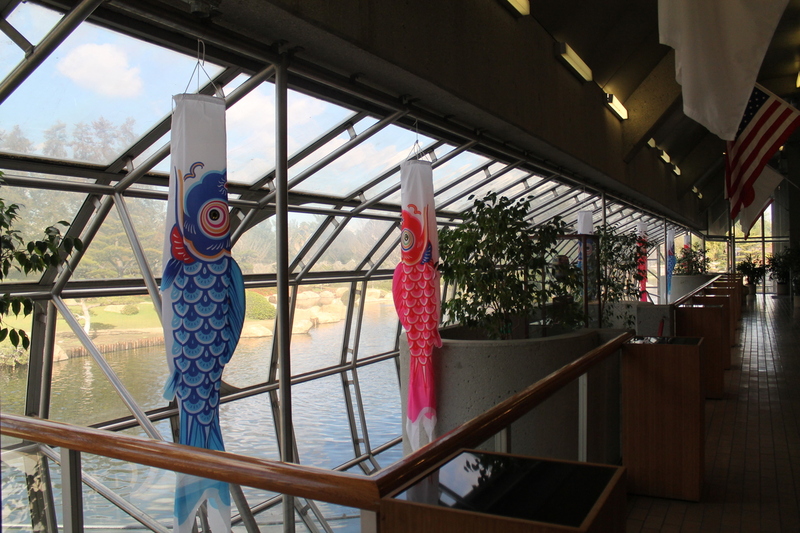 Just as at Hyperion, the headworks building was pretty smelly. 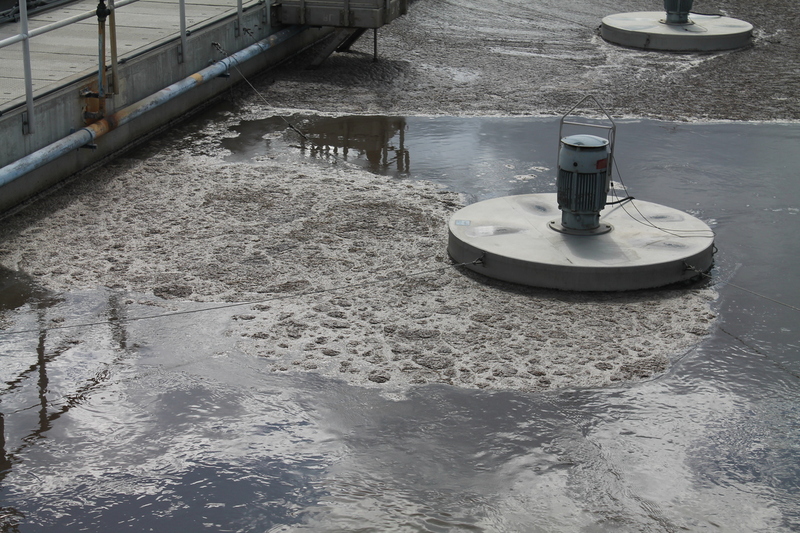 From there, the water went to the aeration tanks, which had big brown frothy mats of bacteria floating on top. Yick. 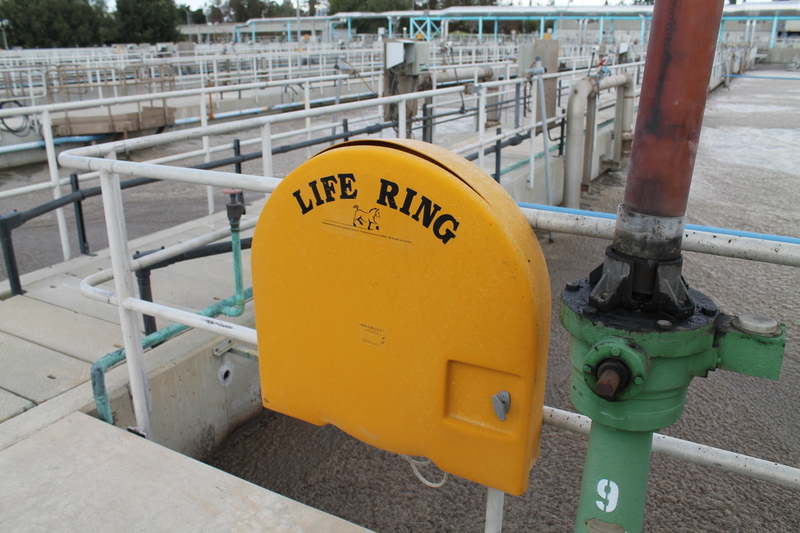 We were all a bit horrified by the life preserver rings they had next to each tank. But I guess the only thing worse than falling into a tank of sewage would be to fall into a tank of sewage and drown. That would be worse than being a drummer for Spinal Tap. 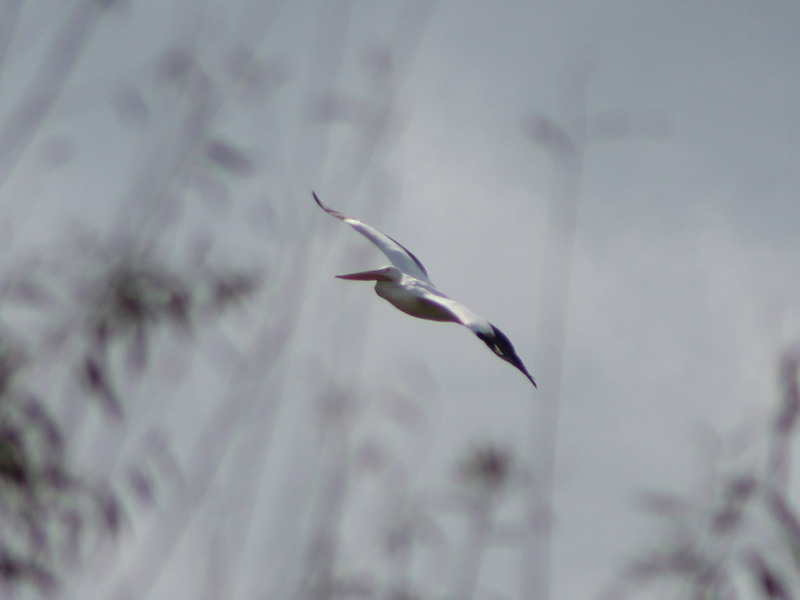 After that, the water went to skimmers that skimmed off the floating material and whatever settled to the bottom. 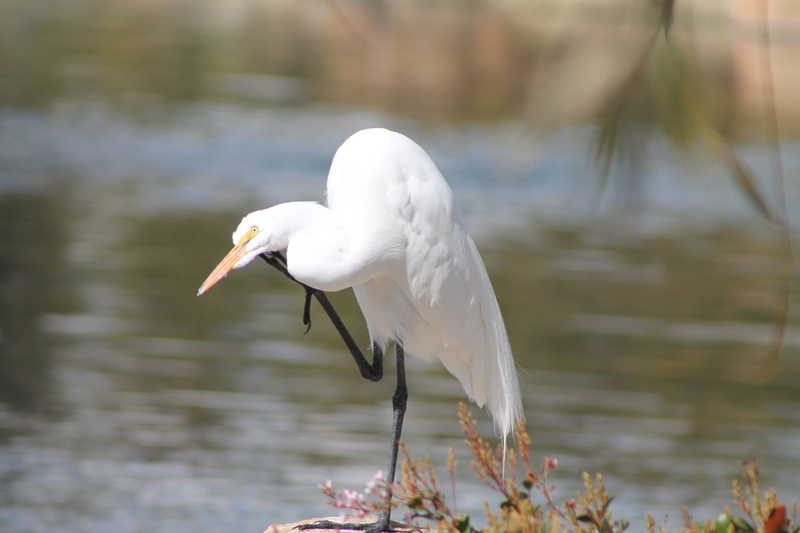 And finally, the relatively clear water was chlorinated to kill bacteria, and then de-chlorinated before being released into the lake, to Lake Balboa across the street, and into the L.A. River. 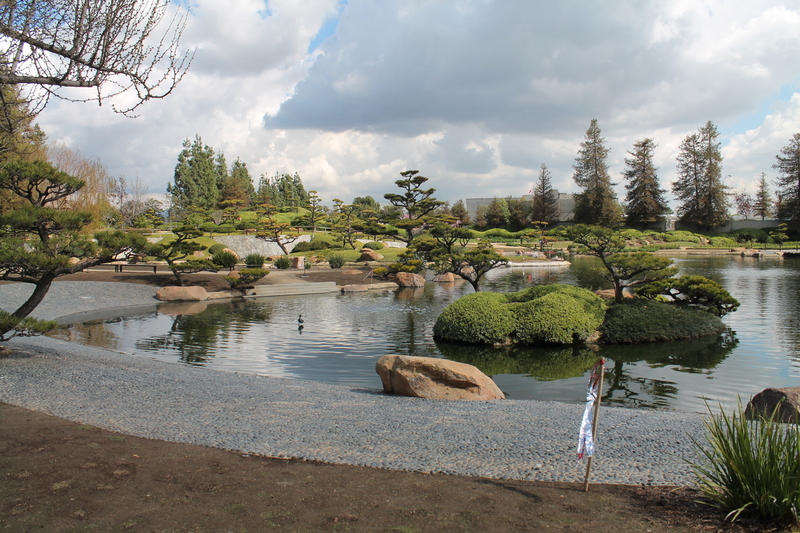 After the plant tour, a second docent took us on the tour of the Japanese Garden. 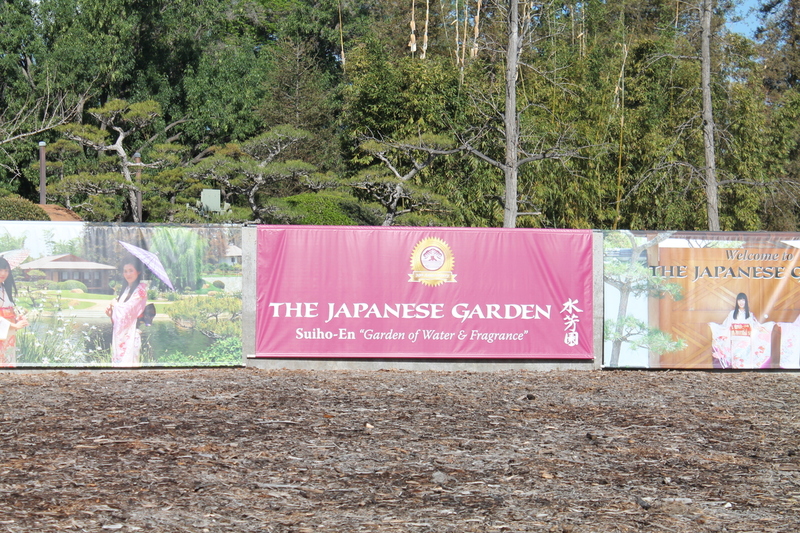 And yes, he said that the choice of the garden’s name as “The Garden of Water and Fragrance” was deliberate. 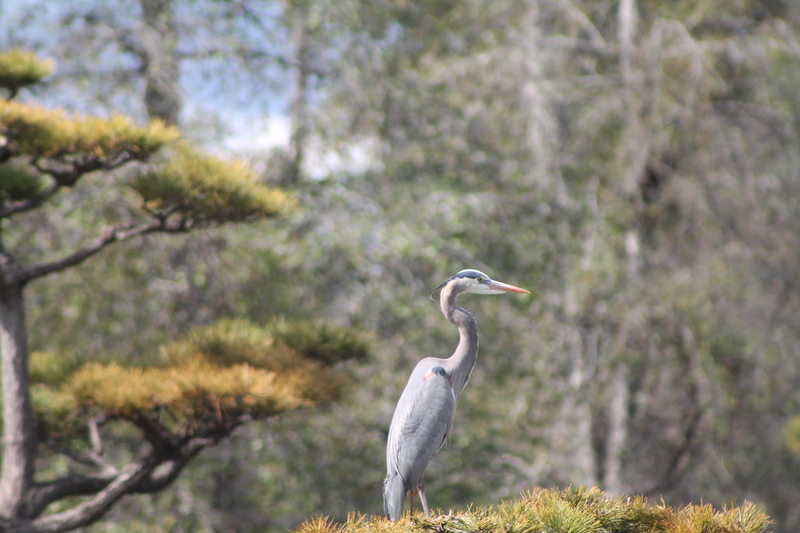 He took us around, pointing out the various birds, and the rocks and plants, with some attention to the aesthetic goals of how things were set up there. Along the way, we stopped in at the Tea House, which was used for filming a scene from “Austin Powers: International Man of Mystery“. 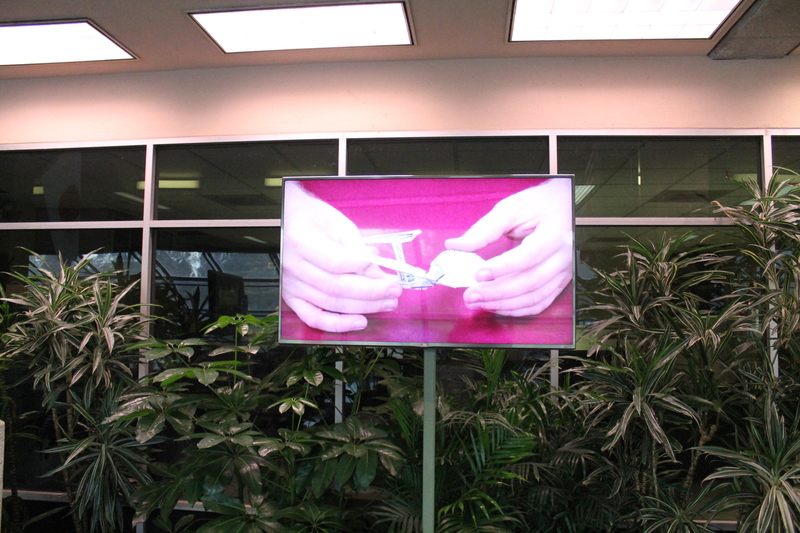 Apparently, the garden gets filmed a fair bit. 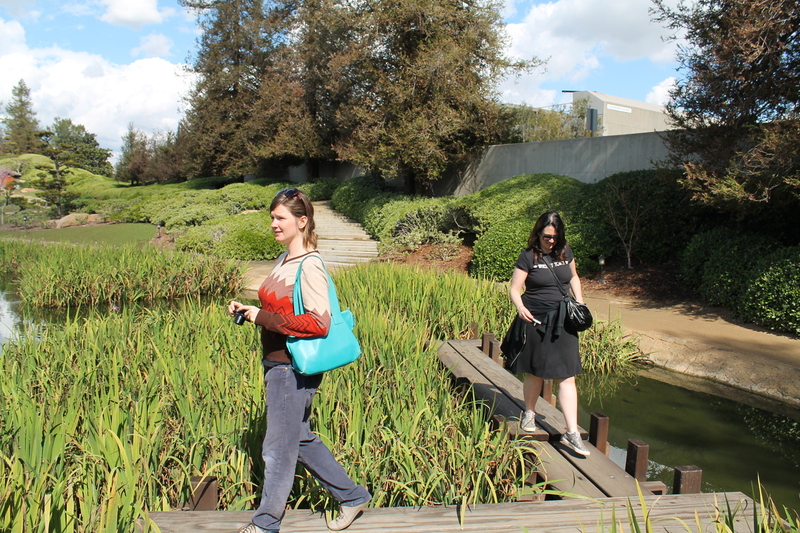 Finally, we walked around the outside of the lake and over the zig-zag bridge. It was an interesting and entertaining tour. And hey! Starfleet! I went out for a little ride today. 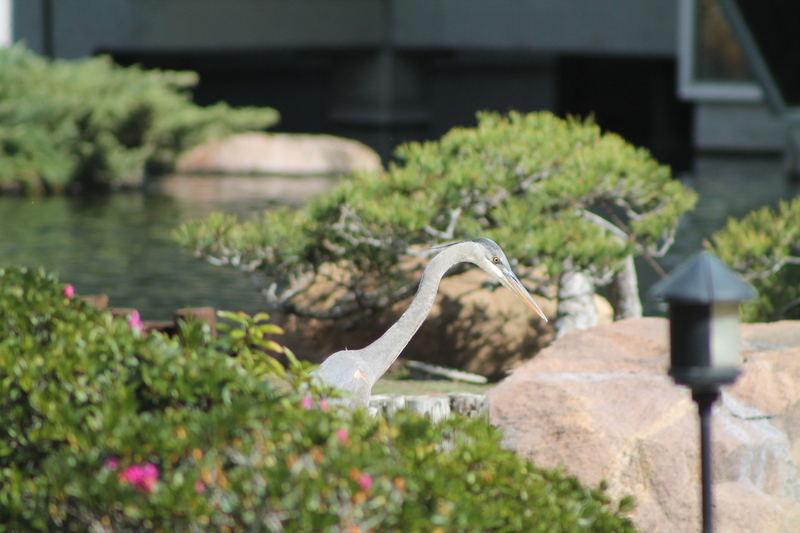 Mostly because I needed to stop by my office and water the plants, but also just because it was a nice day. So after leaving the office, I kept riding. 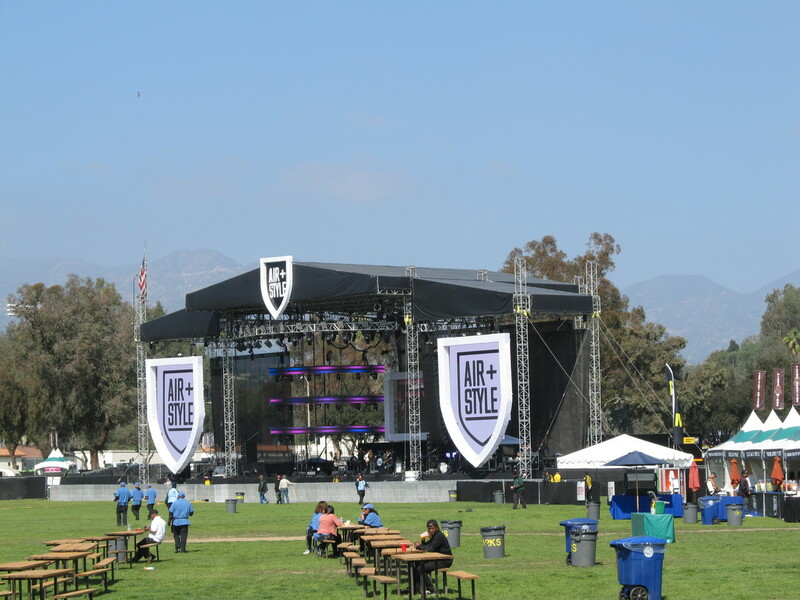 When I was near the Rose Bowl, I saw signs for “Air and Style”. 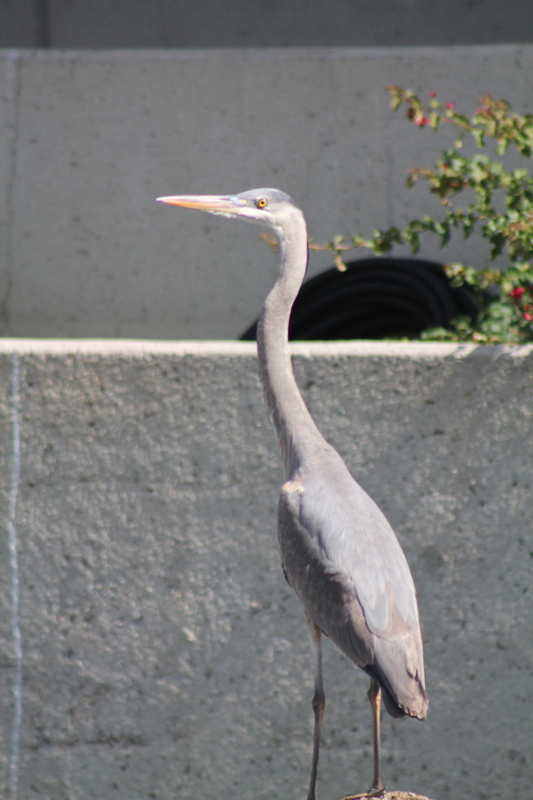 I had no idea what that was, but when I was crossing the bridge that’s just up the hill from the Bowl, I looked over and immediately stopped. 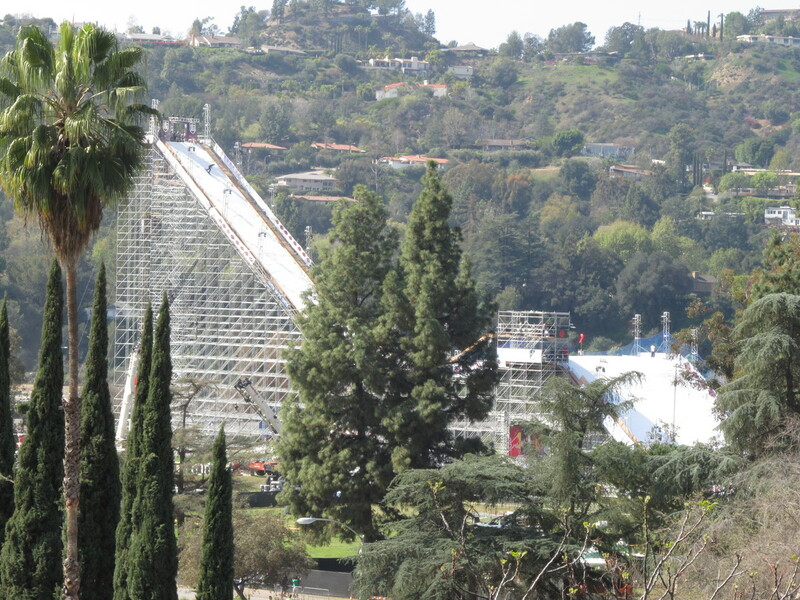 I saw a giant ski-jump ramp, covered in what I guess is shaved-ice fake snow, and guys on snowboards going down it and flying through the air. 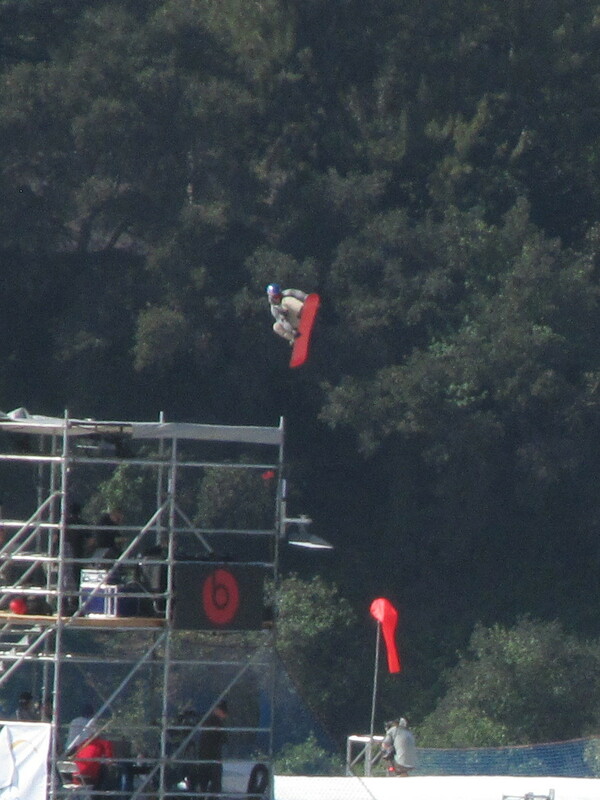 This was sufficiently bizarre that I had to alter course and go down the hill to see it better. I watched for a bit, just marveling at how big the thing was, and how the guys going down it seemed to treat it like it was nothing special. So there’s always something weird going on around here. I like that. 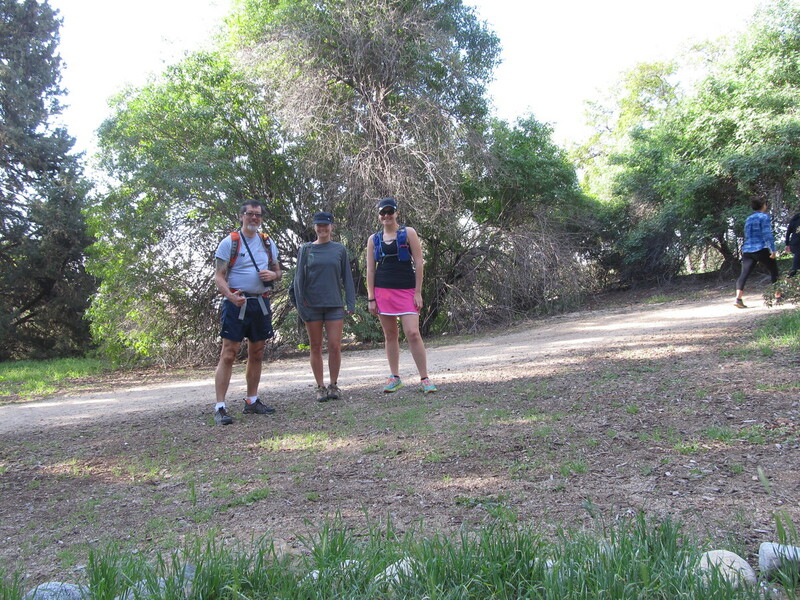 Since it’s a government holiday, we have the day off, so I went hiking with Karina and Erin from my office. 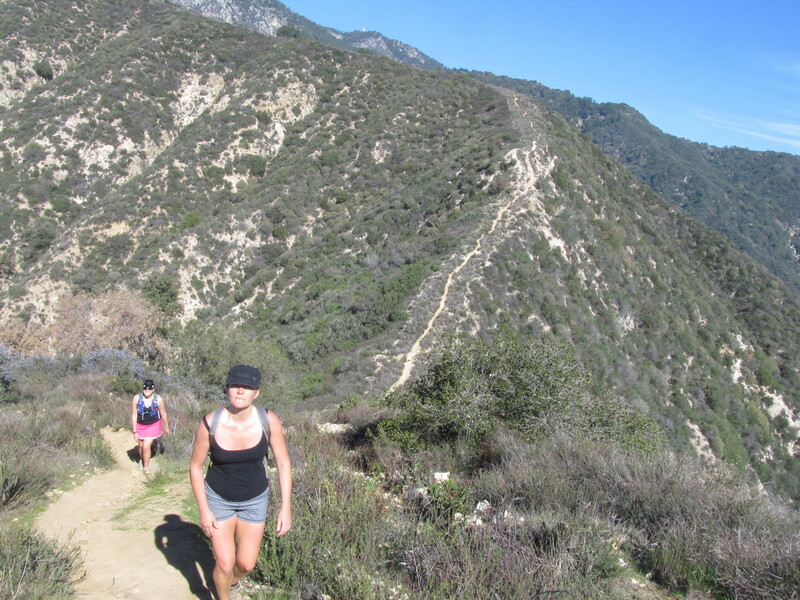 Our destination was Jones Peak, which is just a little mountain in the front range of the San Gabriels, just above Sierra Madre. The trail is not very long, but it is reputed to be much harder than it seems like it should be. 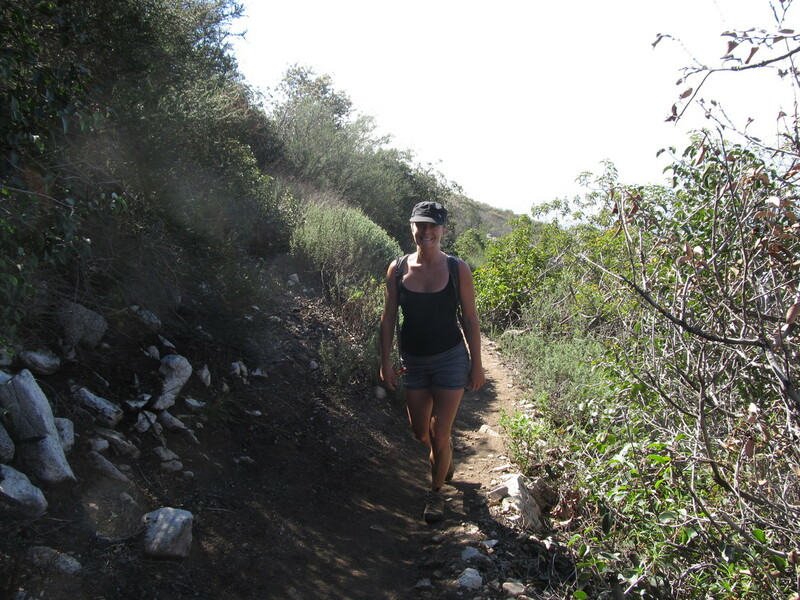 Like the trail up Mount Lukens, this trail didn’t fool around. It was steep from the start. 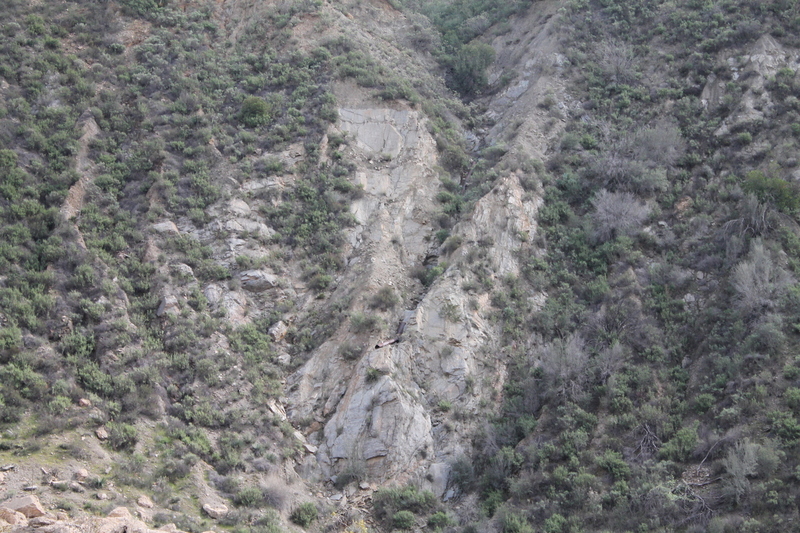 There was just a short walk up into Bailey Canyon before it turned and started switchbacking up the side of the canyon, before coming out at the top of the ridge connecting Jones Peak and the main mass of Mount Wilson. 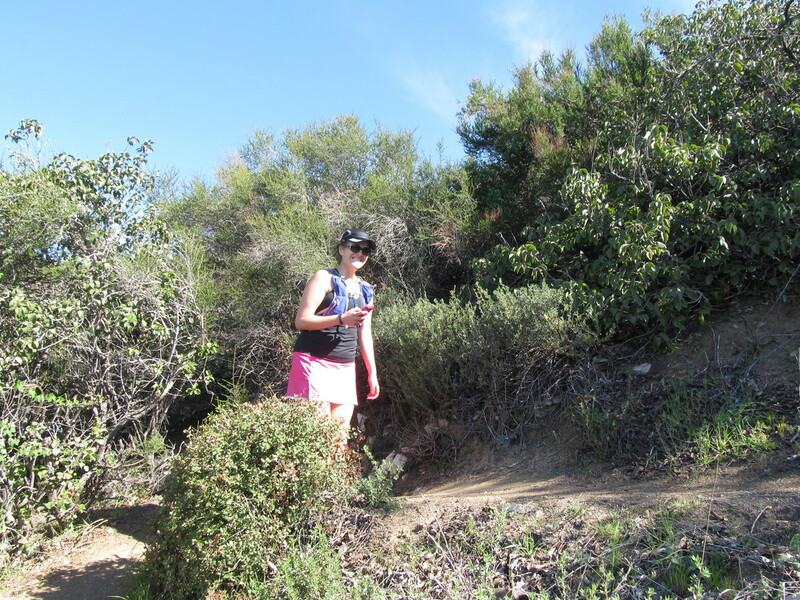 From there, it was just a short, but very steep climb up to the actual top of the mountain. There wasn’t anything much on top, but the view was very nice. On the way down, we took a look down a little side trail. It went to the ruins of a small cabin. 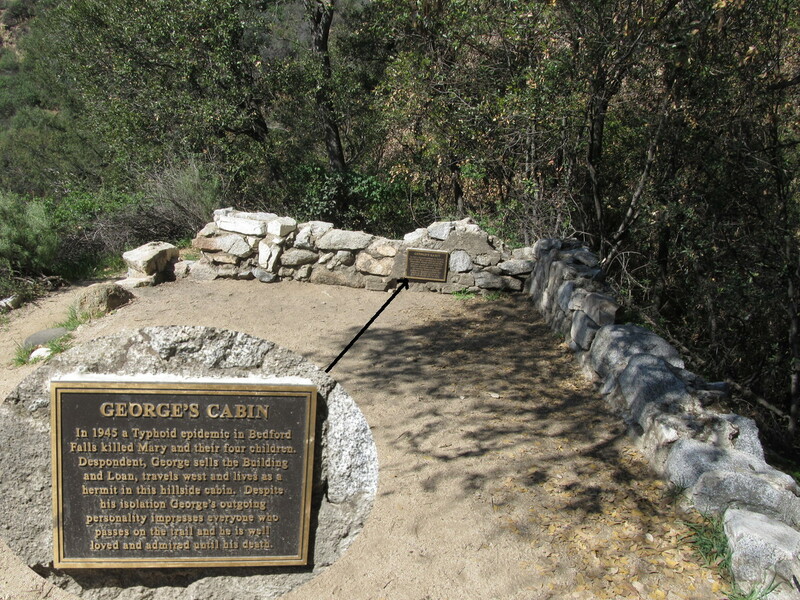 Since it’s in Bailey Canyon, someone had taken the trouble to make a up a plaque proclaiming that the cabin had belonged to George Bailey from “It’s a Wonderful Life”. 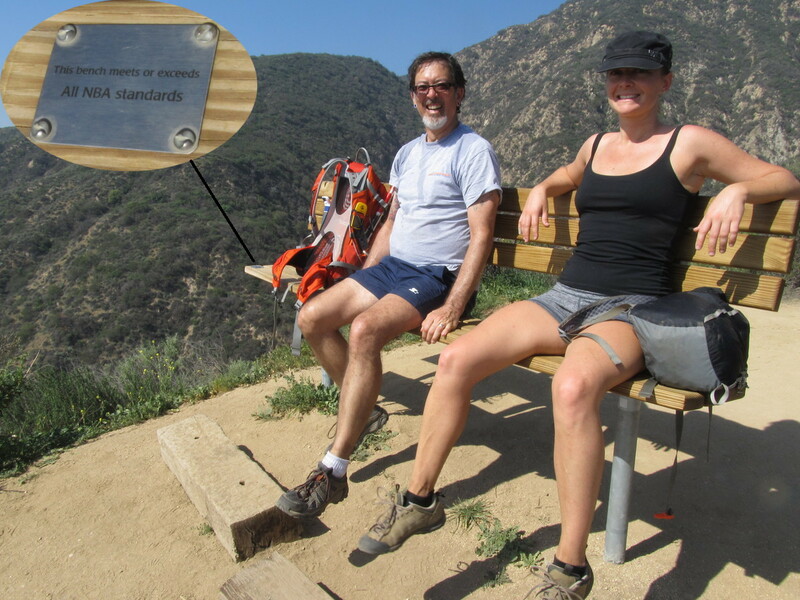 A bit farther down the trail, we stopped at a scenic overlook with a couple of benches. One of the benches was very tall, and our feet didn’t reach the ground below it. That was when I noticed the small plaque on the bench saying that it “…meets or exceeds All NBA standards”. Heh. It was a nice hike. This week’s bike club ride was a trip out to Studio City to get gelato at Gelato Bar and Espresso Caffe. 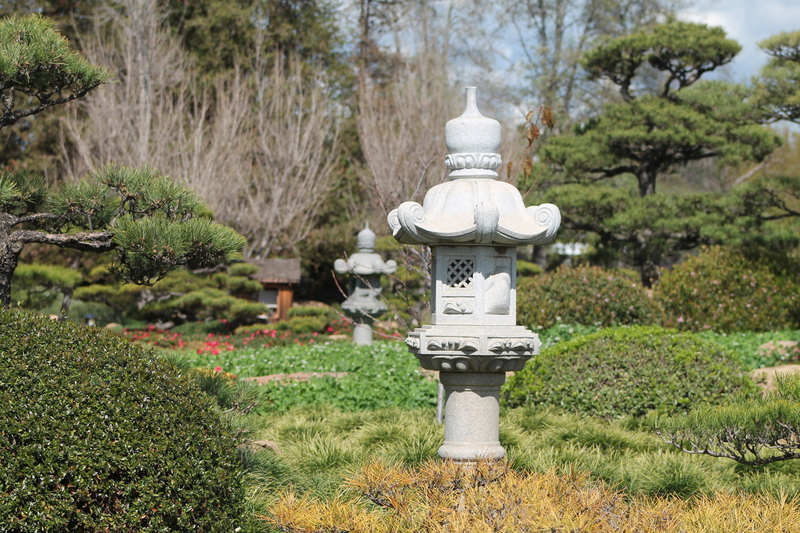 It’s a destination, and it was a nice warm day, so it seemed like a good place to go. 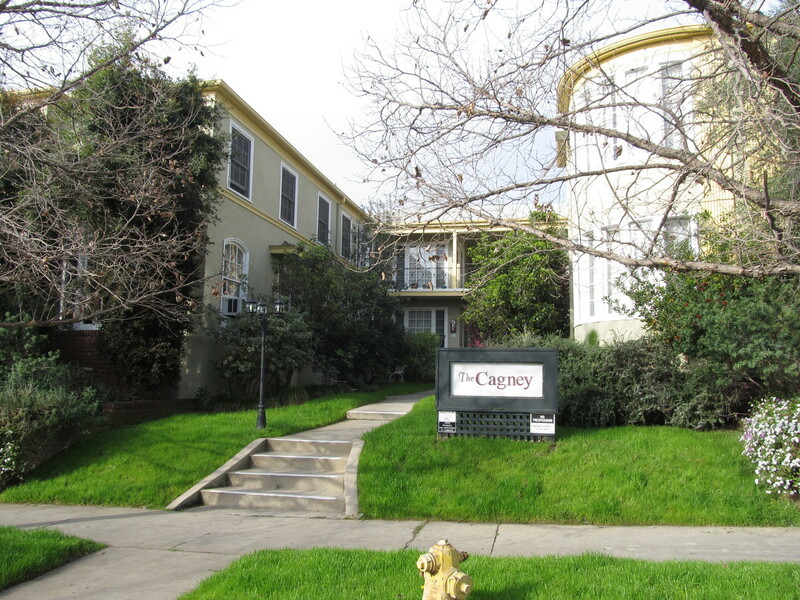 On the way there, Jeff wanted to take a little side trip to try riding up Eldred St. 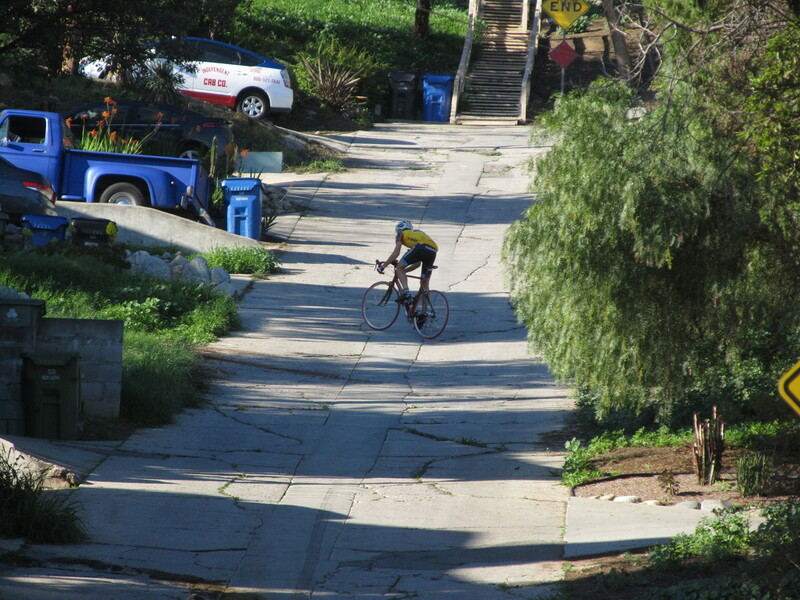 This is a short dead-end street that ends in one of the steepest hills in Los Angeles. In the end, his Garmin said the grade averaged 23%, but that the final pitch to the top hit 44%. And the fact that it’s broken and rough concrete just made it even harder. The rest of the ride was pretty straightforward. 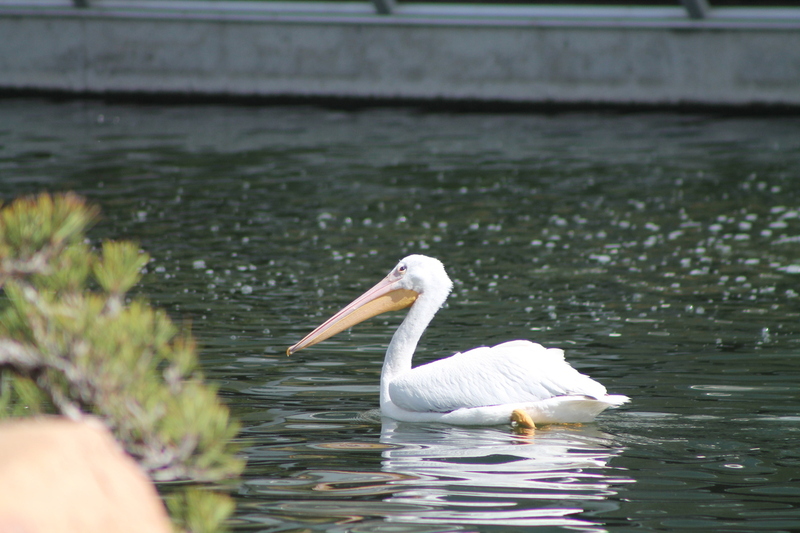 It was a nice fast trip up the L.A. River bike path, and then a straight shot out across Toluca Lake to Studio City. The trip back was flat across Glendale, and then a trip up and over Linda Vista and Lida St to get back to Pasadena. 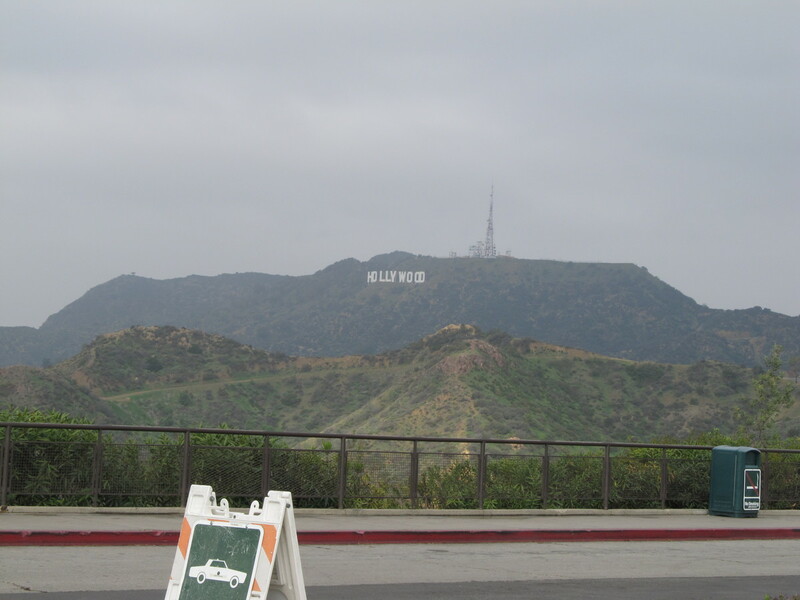 The basic plan was to ride to Hollywood, see Lyman Place, and then go up and over the hill through Griffith Park and then home by way of South Pasadena. We got there pretty fast, and we took a turn up and down the block to see all the buildings. Then we headed up Hillhurst to the park. The climb up the hill to the observatory was a joy, as always. At the top, we stopped for a few minutes to look at the view. 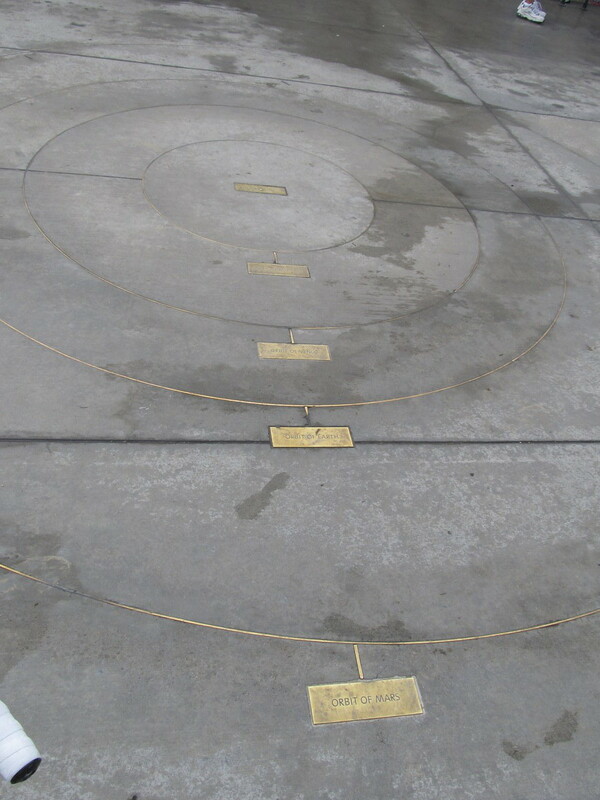 I also had a look at the scale model of the solar system they have built into the sidewalk in front of the observatory. 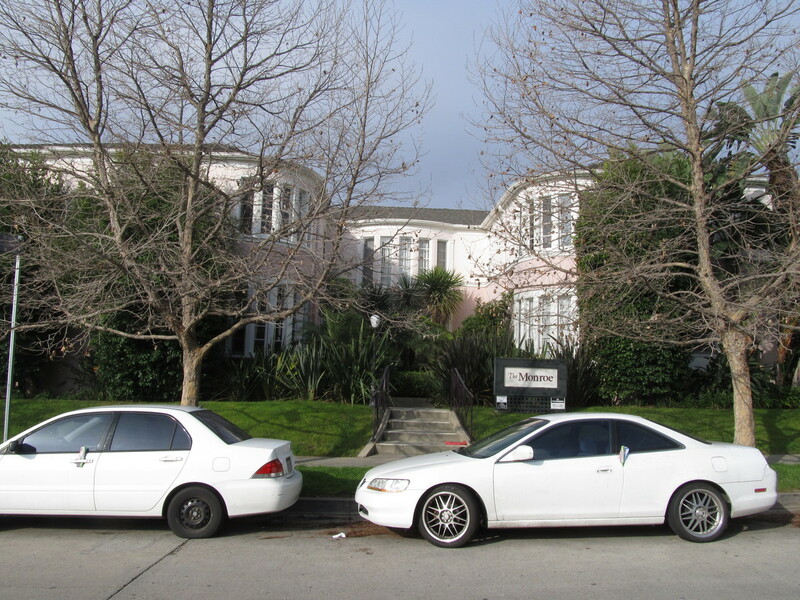 They re-did the whole observatory building a few years ago, but I guess they didn’t redo the sidewalks in front. Their solar system still includes Pluton as a planet, even though it was removed from that post in 2006. After that little rest at the observatory, we rode up and over Mt. Hollywood and came down into the Valley side of the park. We had our snack stop at Priscilla’s. 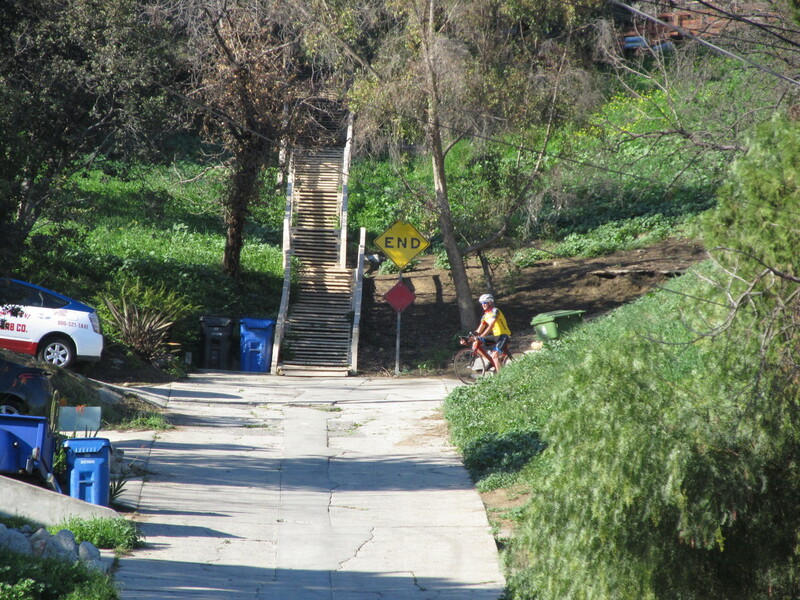 Then we took the L.A. River bike path back to Fletcher, and then back up Eagle Rock Blvd to York, and back home across South Pasadena. On Saturday morning I went for a short bike ride with Carla. We headed east, with a plan of seeing how the yard and shops they are building on the Metro Gold Line in Monrovia were coming along. We rode out there, and we saw a crew at work putting up the overhead wires, as well as a single test train parked on the track. That was novel, since it’s the first train we’ve seen on that part of the line. 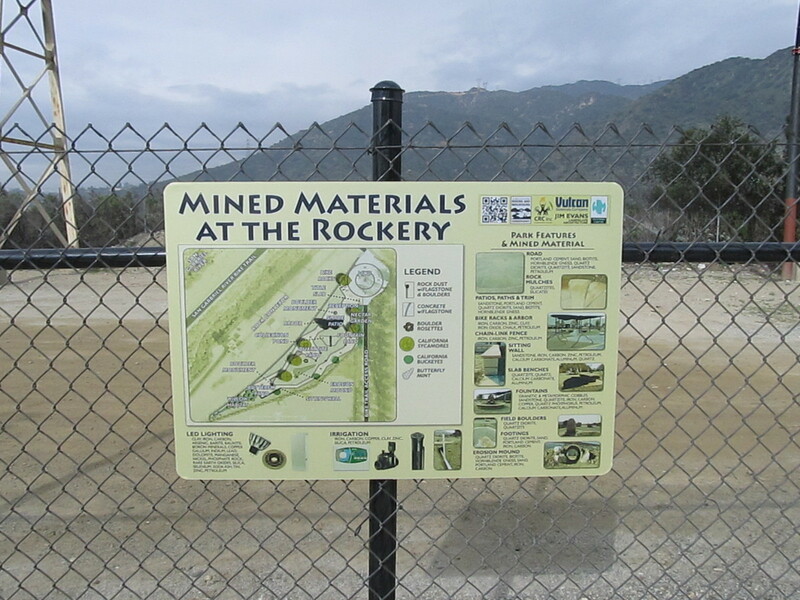 Continuing on, we passed the Azusa Rockery. 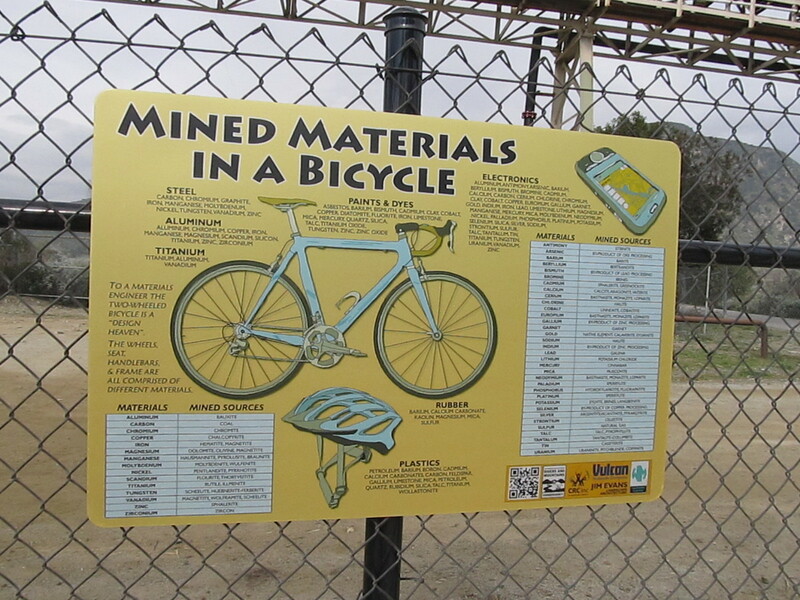 Apparently, it’s an exhibit of the sorts of things they mine there in the quarry in Azusa. 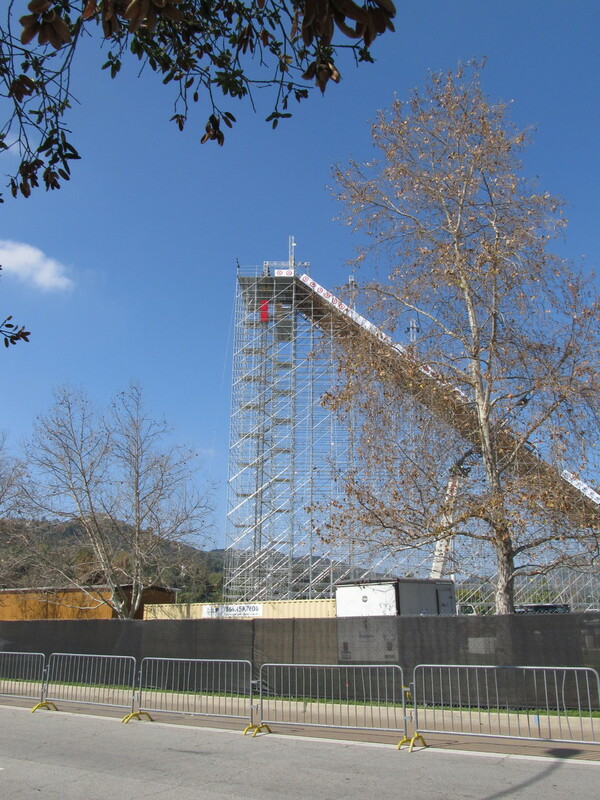 From there, we rode to see the downtown Azusa station that is under construction. 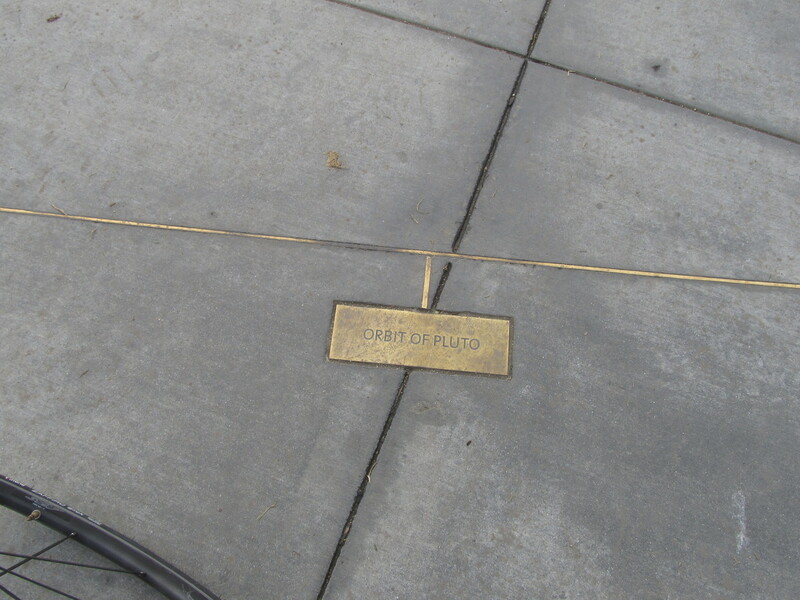 We were going to see if we could find the ‘golden spike’ again. 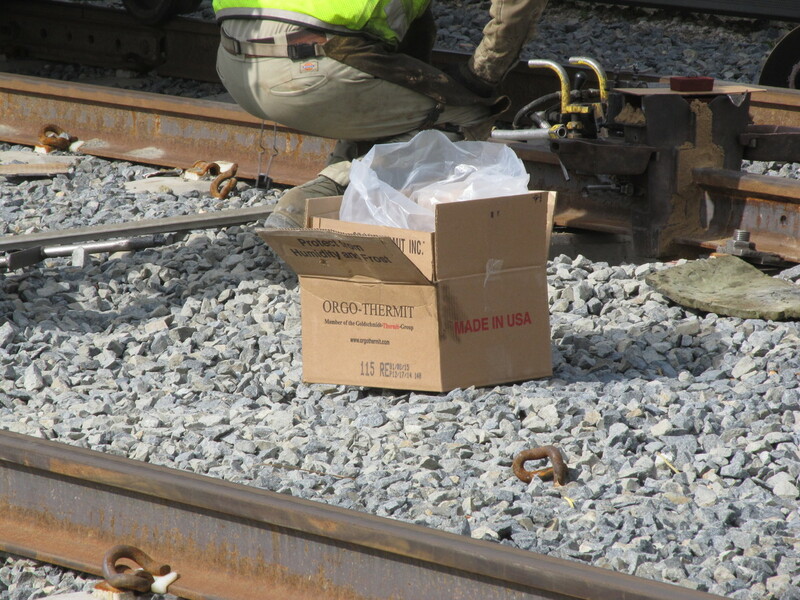 While we were there, a truck came by on the tracks, and they stopped just a short distance from us. The guys got out and started unloaded some serious equipment. 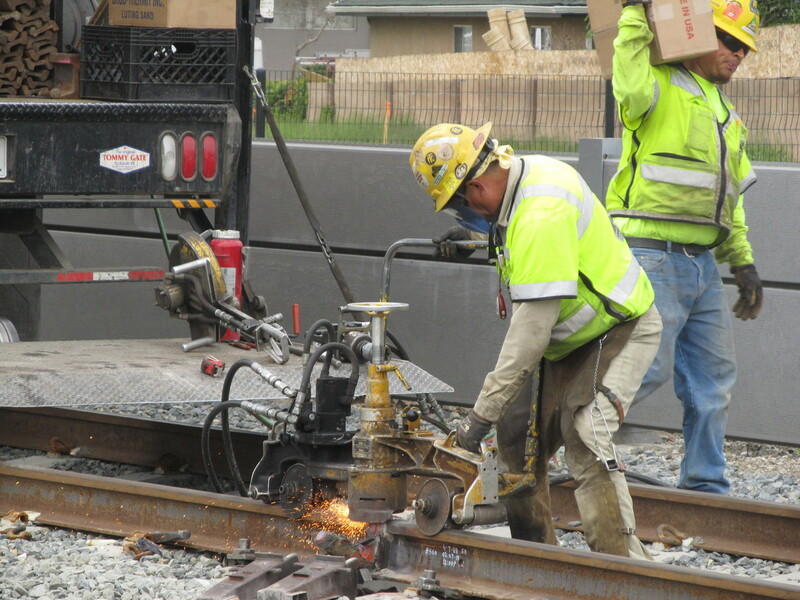 We asked them what they were doing, and they said they were going to weld the rails together. 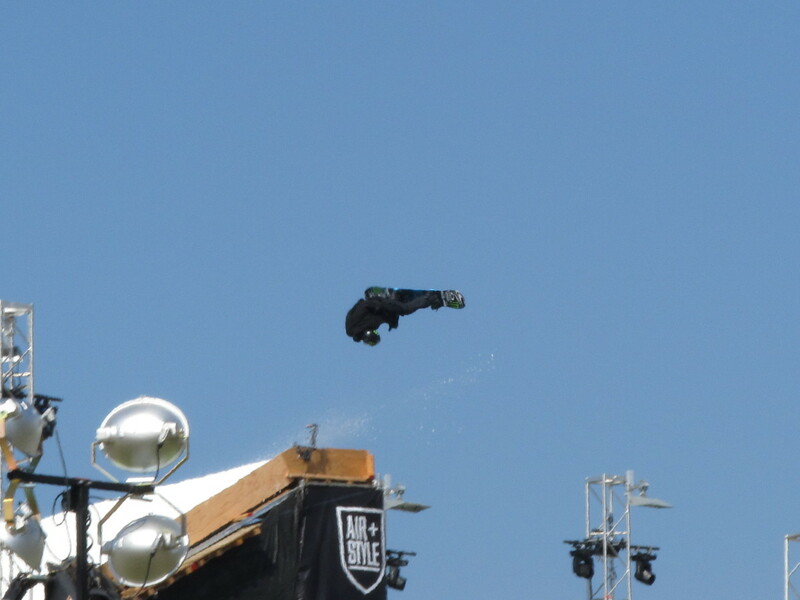 So we figured we’d settle in and watch, since I’d always been curious to see how this is done. 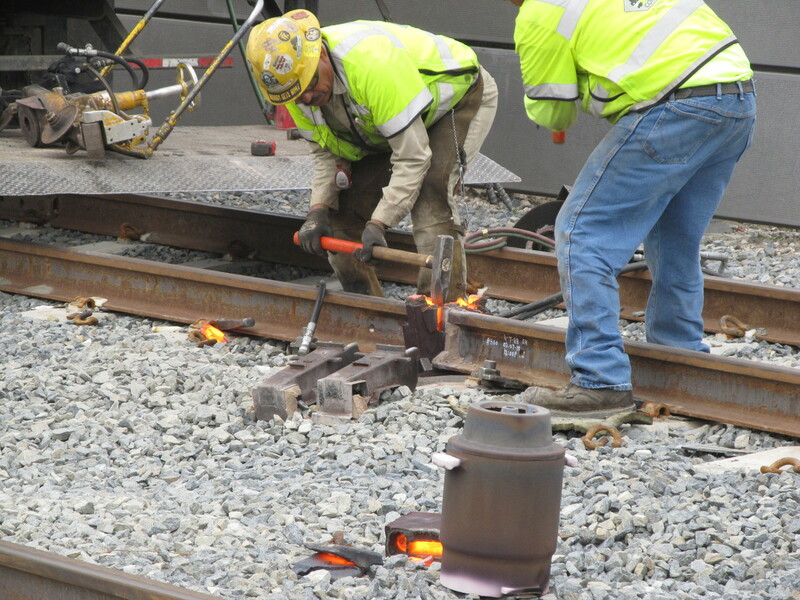 They first took some wrenches and unbolted the spot where the rails were bolted together. 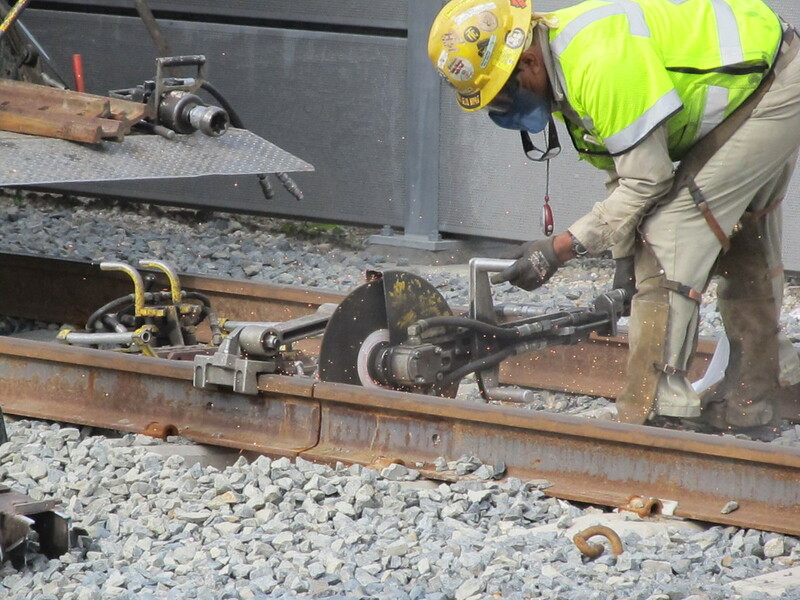 Then they took out a big power saw and cut a little bit off the end of one rail to make about a 1/2 or 3/4 inch gap between the ends of the two rails. Then they got out what looked like some ceramic molds that they clamped around the rail joint, filling in the gaps with sand. 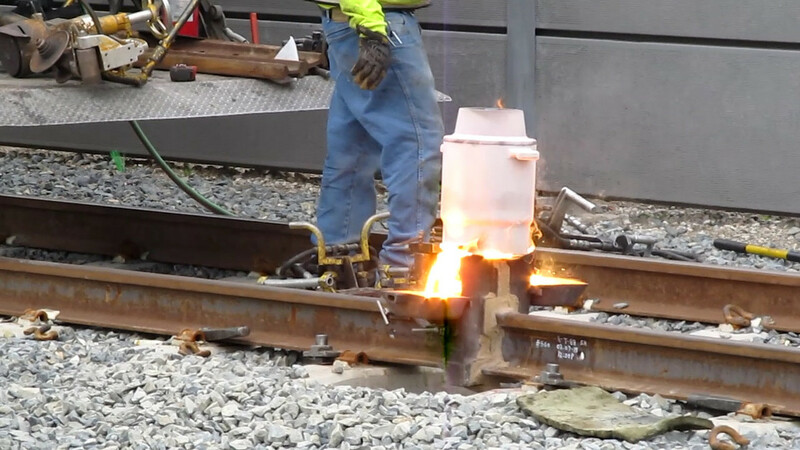 Once all that was in place, they lit a torch and stuck it down into the space inside the mold they’d constructed around the rail joint. While the torch was making flames come out of the top of the mold, they brought out a box of thermite. At that point, I knew we were going to see some fireworks. After the torch had been heating the joint for a few minutes, they took it out, and then they placed a little white can that looked kind of like a big thermos on top of the mold. Then they lit it on fire. Bright yellow flames came out the top, and soon, glowing-orange molten steel was pouring out the bottom. 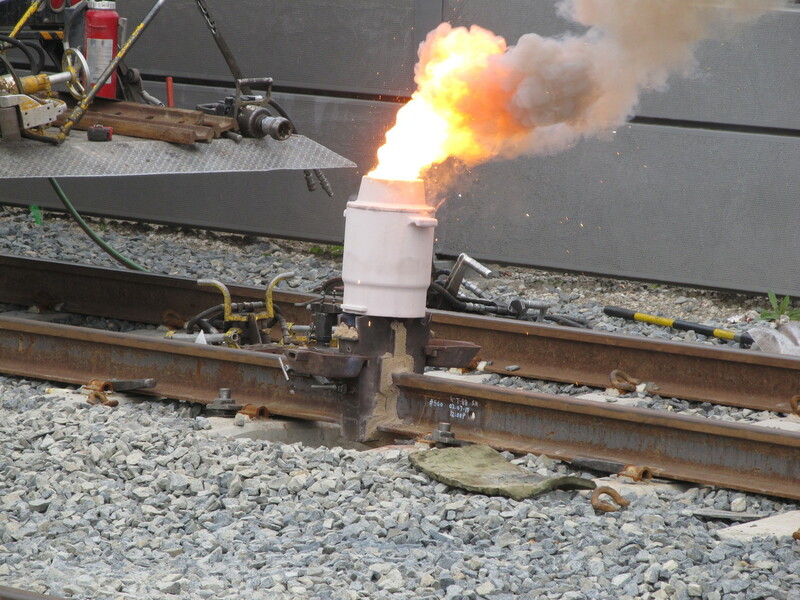 It flowed into the mold around the rail joint and filled it up until a small amount of molten steel came out the top of the mold. 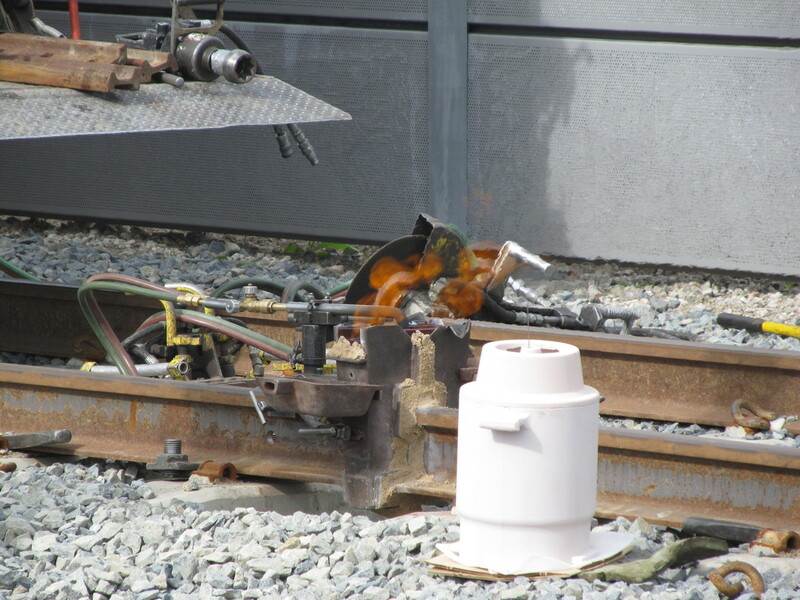 I guess that was the indication that it had filled the gap between the rails. They let the joint cool for a few minutes, and then they broke the mold off of it with sledgehammers. The metal inside was solidified, but still glowing orange. They cleaned it up a bit with a sledgehammer and a wedge. Then they got out a grinder machine that cleaned up the weld. All told, it was a pretty good pyrotechnic show. 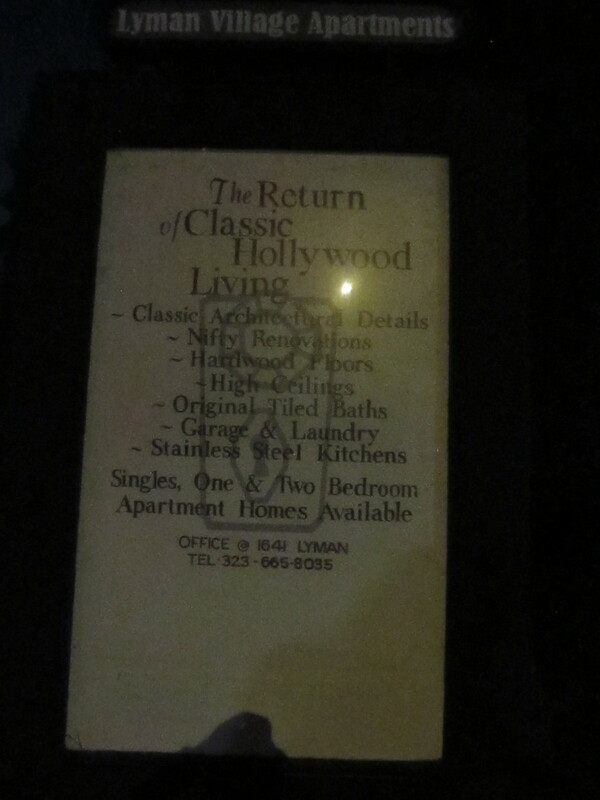 Thursday night, we signed up for a bar crawl tour in Hollywood, on the east end, near Silver Lake. It sounded like fun, so we signed up. And it turned out to be a lot of fun. The tour met up and started at El Cid. 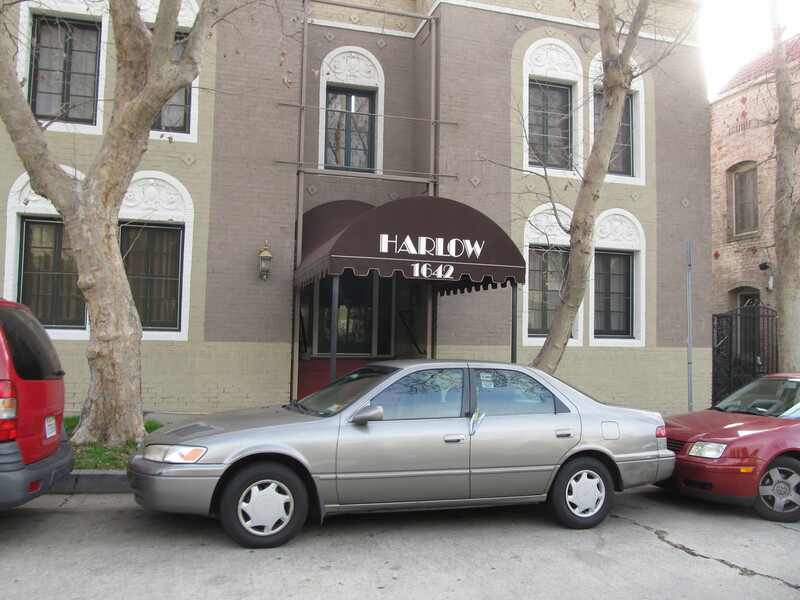 This used to be the Jail Cafe in the 1920s. 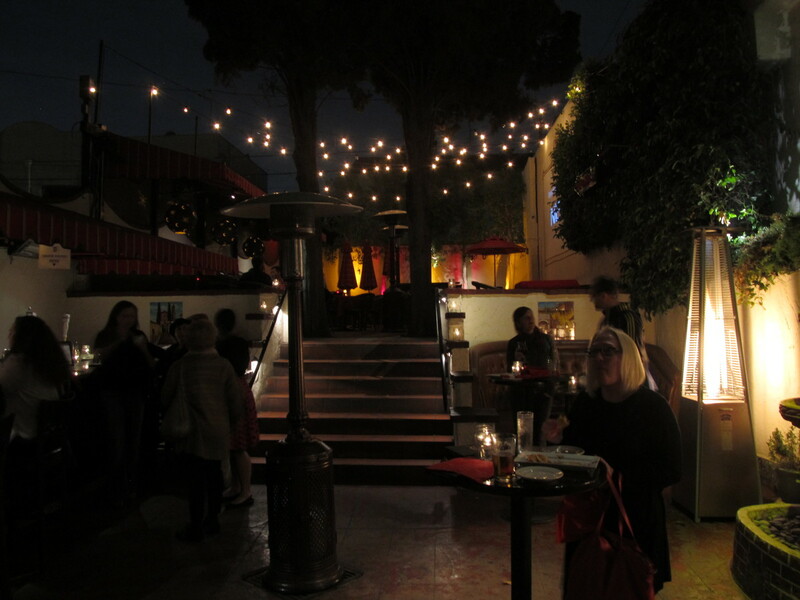 It doesn’t have the prison theme any more, but it did have a nice outdoor bar and patio area. We were there for a little while before the group headed up Sunset to our next stop. Along the way, we stopped at the Elliott Smith tribute wall. 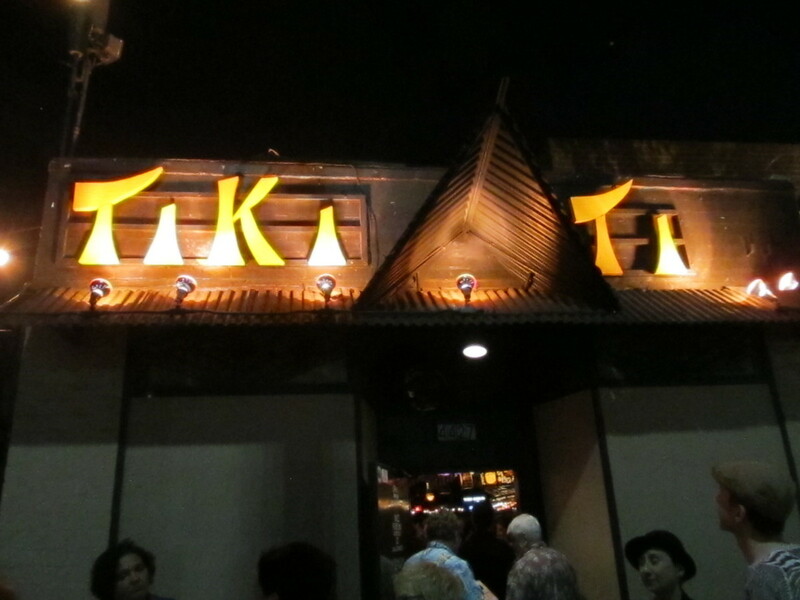 Then we crossed the street to get to Tiki Ti. Tiki Ti is an odd place. We’d heard of it on the Neon Cruise tour, since it’s a local landmark, and also, because of a quirk in the law, it is the only bar in L.A. where smoking is still allowed. 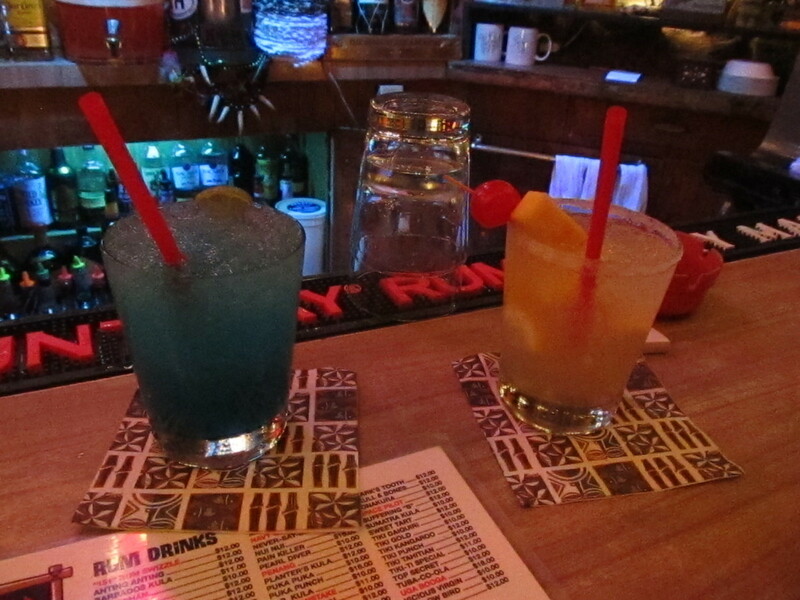 They had a big menu of the drinks they make there, and we just sort of picked a couple to try. 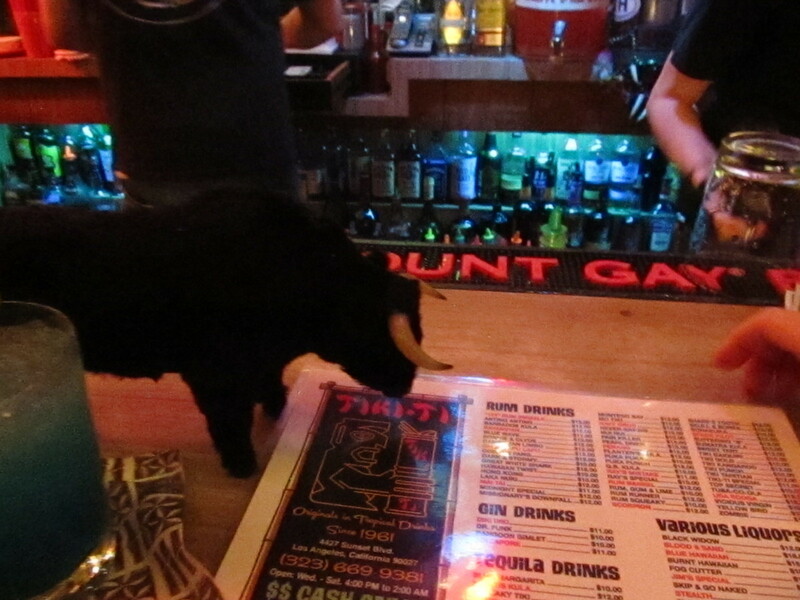 In the meantime, somebody down at the other end of the bar ordered something special, so the bartenders brought out the little animatronic bull and had it walk down the bar. It was all a very odd and entertaining experience. 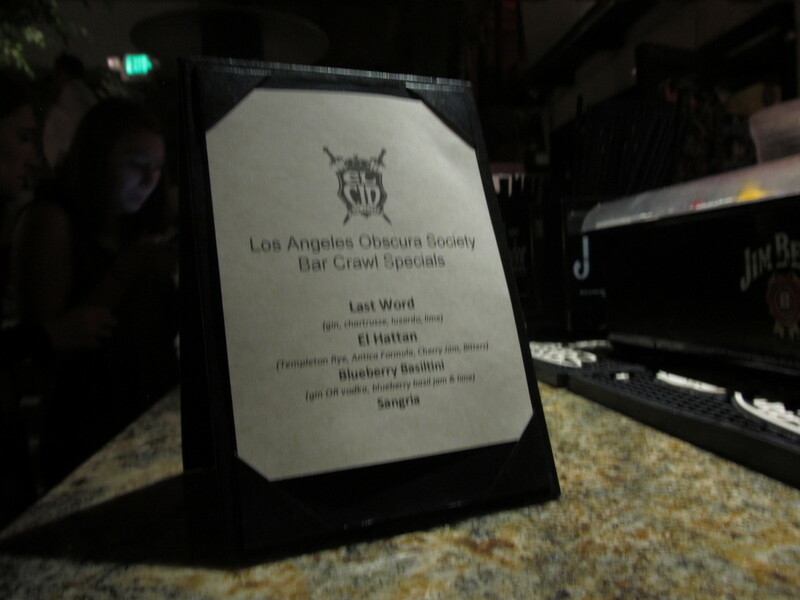 Our next stop was at the Good Luck Bar, which is right around the corner from the Vista Theater. 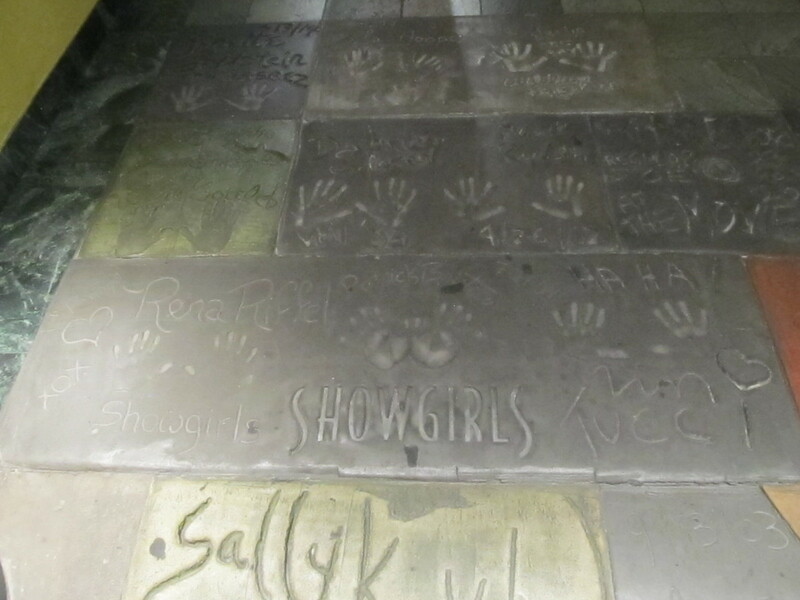 So we stopped along the way to look at the walk of fame of the B-list stars. I’ve been there before with the Sunday morning bike club ride. The Good Luck was also an odd place. It was decorated in a Chinese theme, which is not something I usually associate with a bar. The last stop was the Dresden Room. 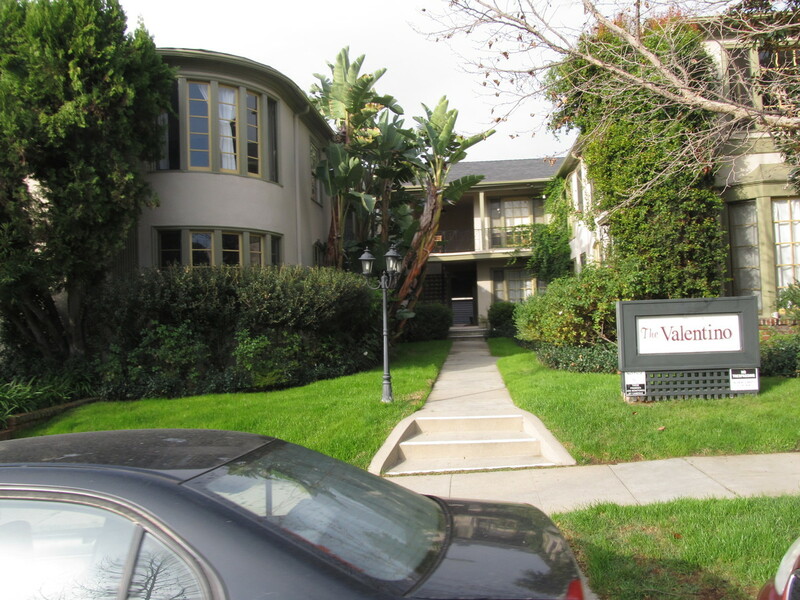 On the way there, we took a walk up Lyman Place, which is an entire block of apartments that are all built and decorated to evoke old-time Hollywood, and each building is named for one or another old movie star. There was a Monroe, a Bogart, a Valentino, and others. When I saw that, I knew this was going to be a sightseeing stop on the Sunday morning bike ride soon. The Dresden Room is another distinctive place. I’d been there once before, in 2008. That time was early in the evening, but this time it was later, and Marty and Elaine were performing. Apparently, they have been playing there for over 30 years. We ordered more drinks and some food. Overall, this was a very entertaining evening. 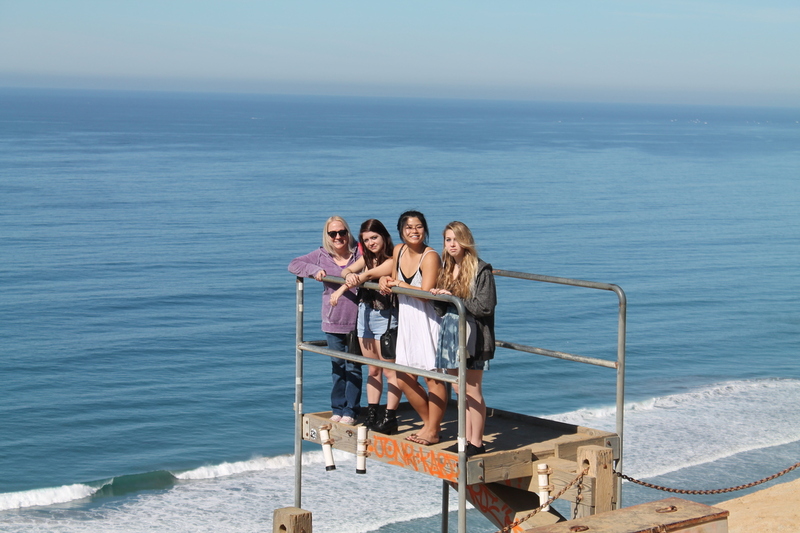 This weekend, we all took a trip to San Diego to visit my father, and also to go see the seals at La Jolla Cove. 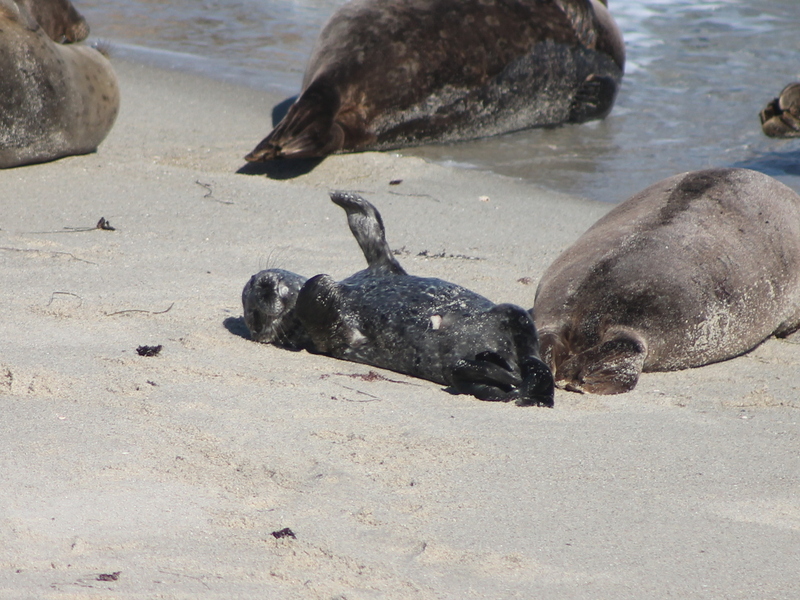 Late January and early February is the pupping season, and there truly is nothing cuter than baby seals. 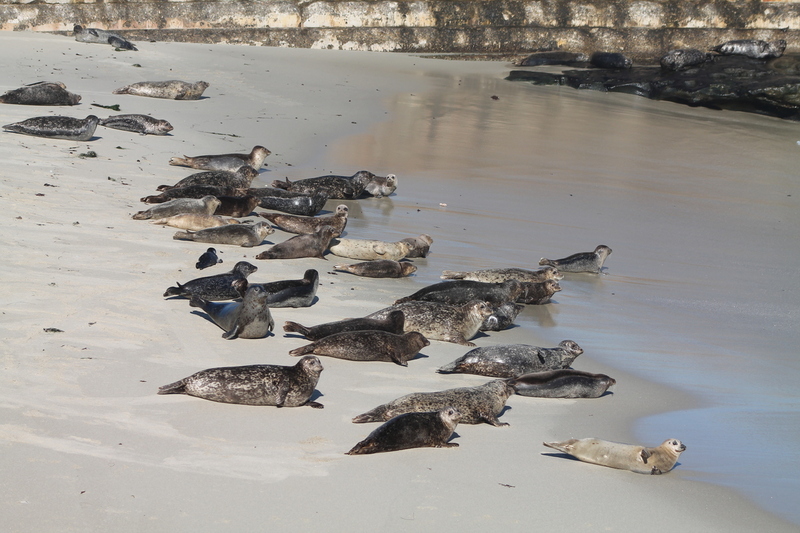 I first saw the seals back in 2007, and we’ve been coming to see them almost every time we come to San Diego since then. 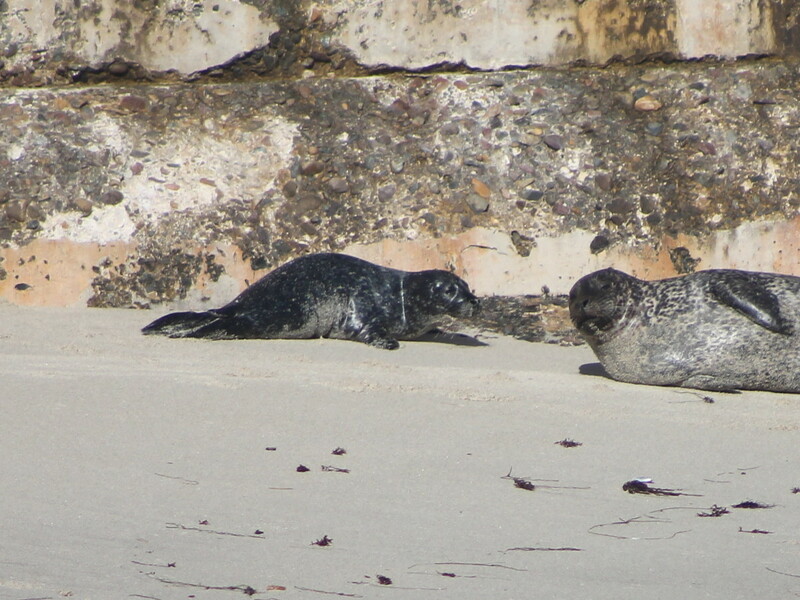 And in particular, we always make a point of coming to see them when the seal pups are being born. 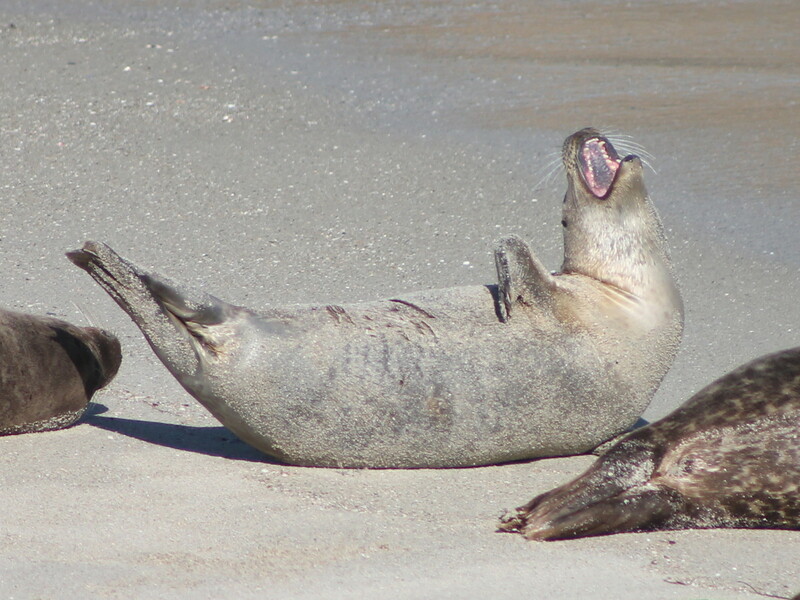 There was a volunteer from the Seal Conservancy at the beach, and he pointed out the new pups and told us a little about them. 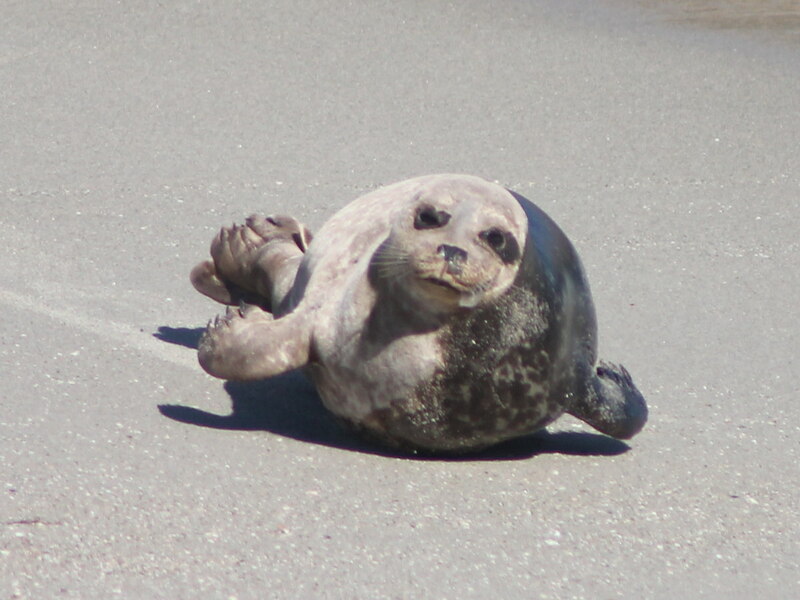 Sadly, there are some people who actively dislike the seals, and like to chase them away. 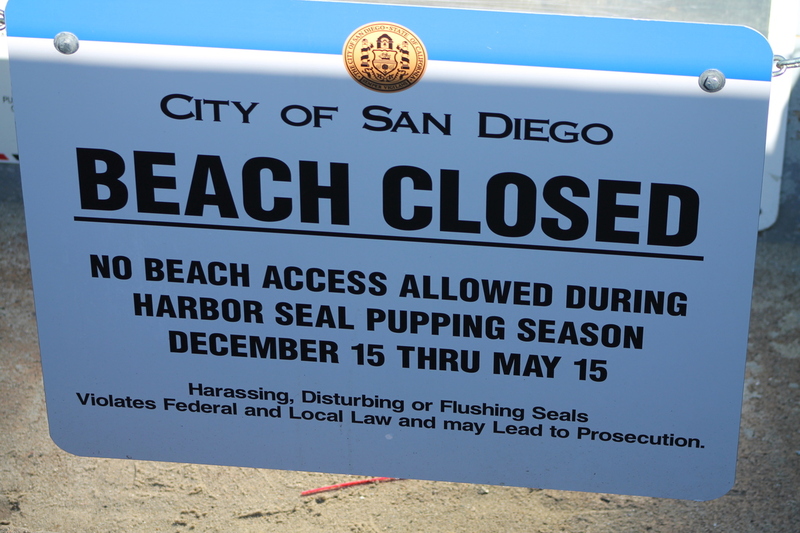 But fortunately, since marine mammals are protected, the courts have ruled that the beach can be closed to people during the pupping season. After seeing the seals, we headed back to my father’s place. 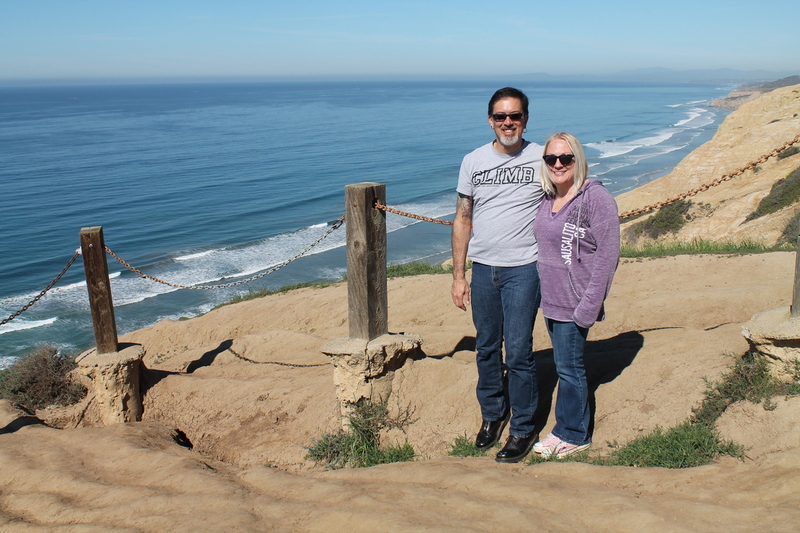 Along the way, we stopped off at the Torrey Pines Gliderport. I’d only seen that once before, back in 1985, and I remember it being pretty spectacular to watch the hang gliders soaring along the cliffs there. 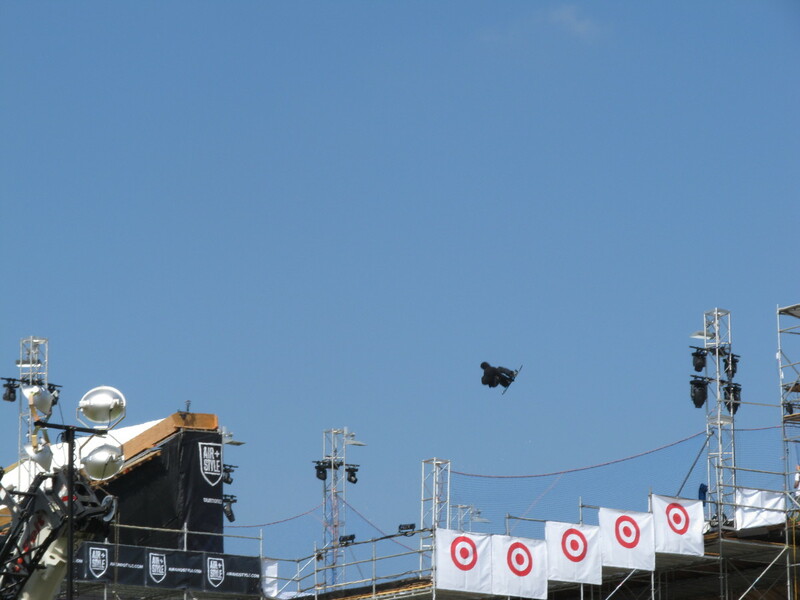 But sadly, there was nobody out flying today. Still, it was interesting to see it again.